Happy New Year ! 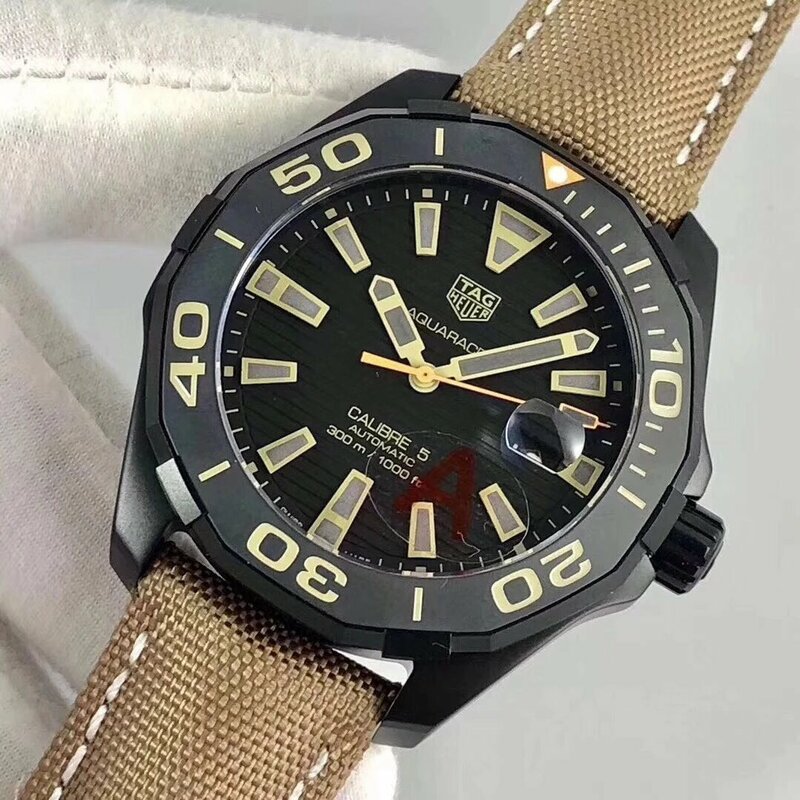 Now, in 2019, do you plan to buy one replica watch? 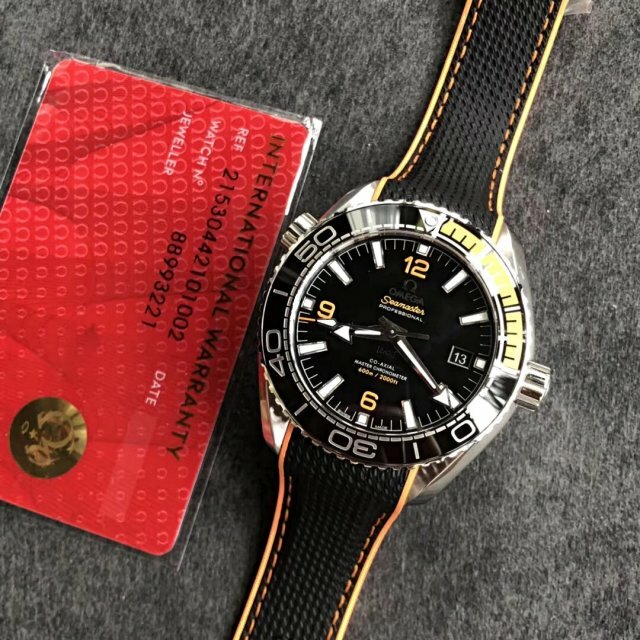 What is your budget for replica watches in 2019? 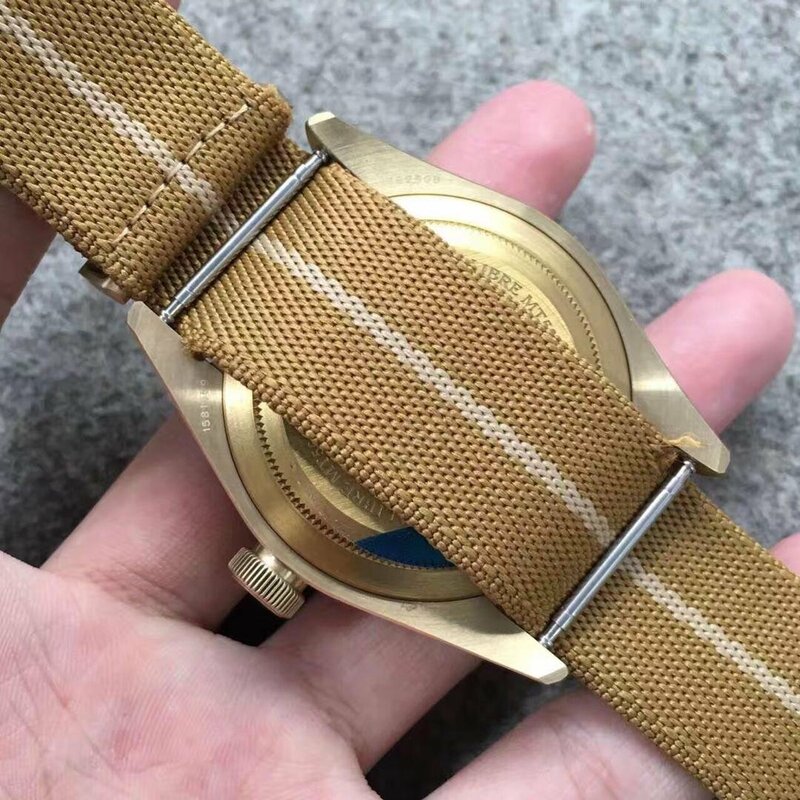 In the new year, all watch factories will continue to improve their flagship models and publish new watches, and the prices of these replica watches will become higher and higher, not only because they are made of better materials, but also closer to genuine models in finish and movement. 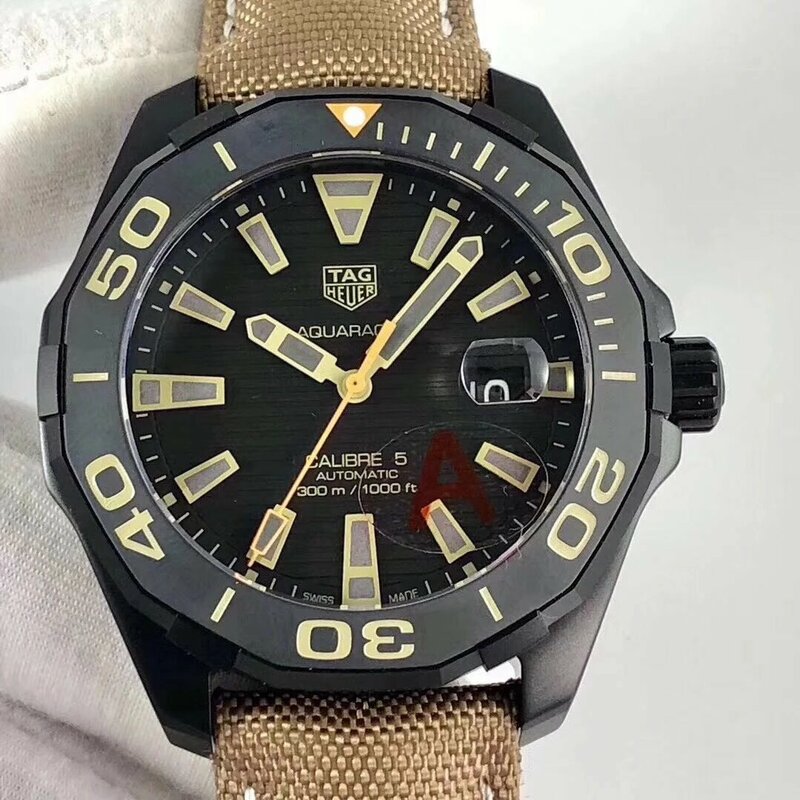 Which watch do you most want to buy in 2019? 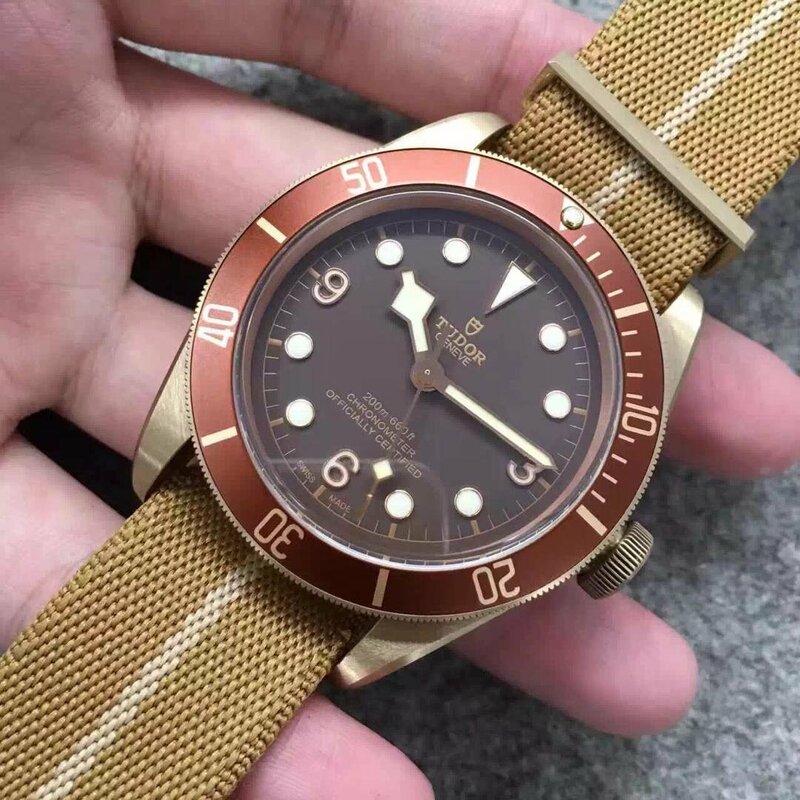 The Rolex Submariner 116610LN from Noob, a PAM from KW factory or an IWC Pilot watch from ZF? 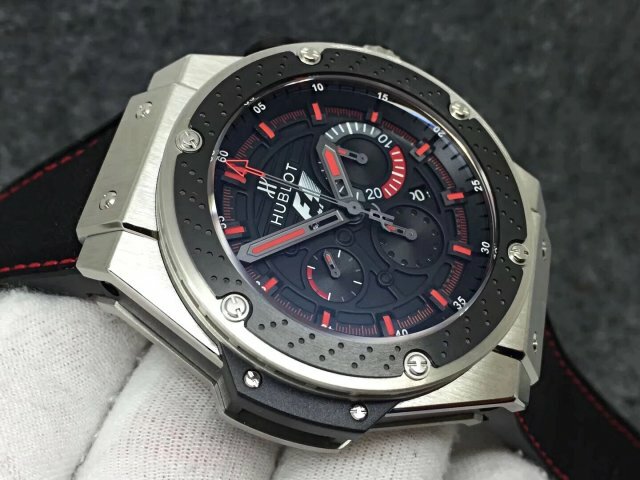 Or you can make your purchase decision after the SIHH 2019 and Basel 2019, there will be a lot of new models published in that two exhibitions, and our watch factories will certainly replicate them once they are released to the public. 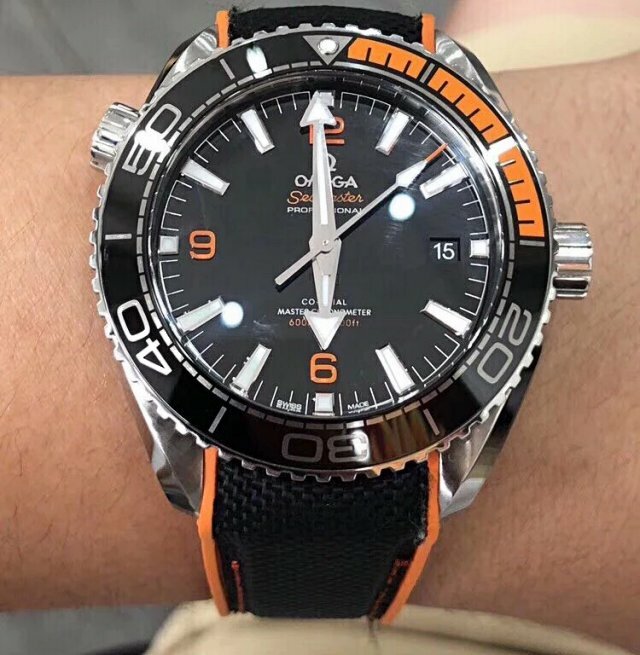 Today, the first post I want to publish in 2019 is about one Omega Planet Ocean replica watch, which was made by VS factory, the replica watch has a high quality like other Omega Seamaster watches manufactured by VS factory, for example, the hot Omega Spectre 007, Seamaster Diver 300m Grey, etc. 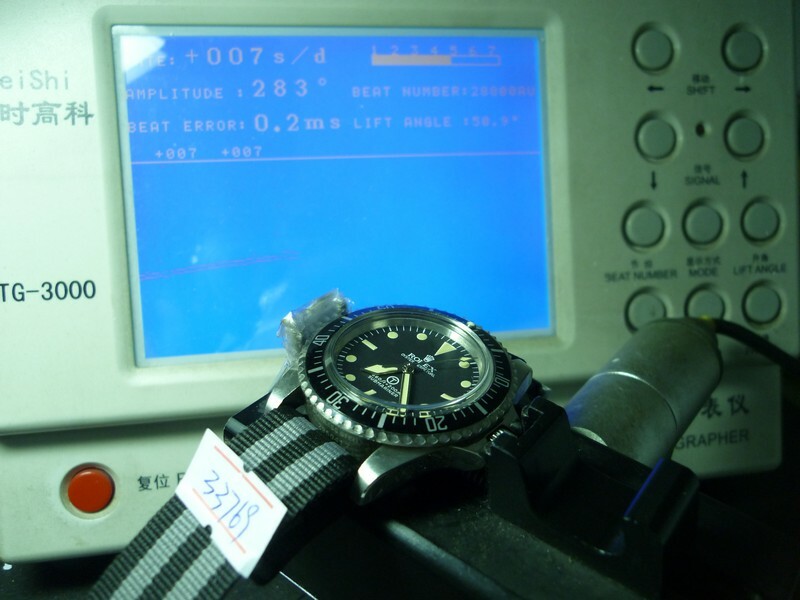 The genuine watch is 600m waterproof, while the replica is tested by VS to be 50m water resistant. 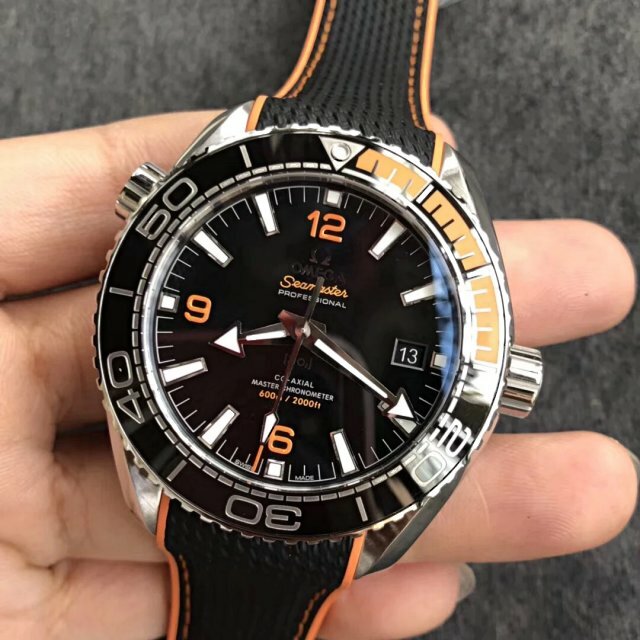 This Omega Planet Ocean watch looks a little big due to its large 43.5mm case diameter, the case is 16mm thick, the whole watch is made of solid 316L stainless steel, so you will feel a little heavy when holding the watch on hand, but this heavy weight gives me a real feeling, I like this feel. 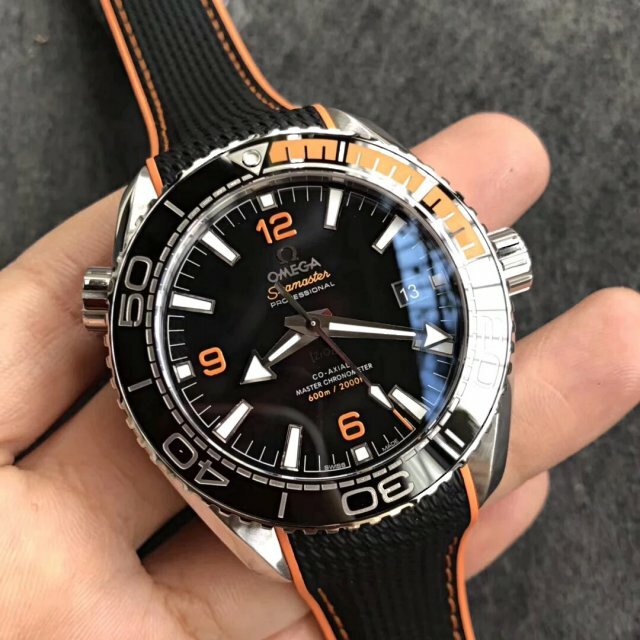 The lugs of Omega Planet Ocean have an unique shape, which look more three-dimensional. On the left case, there is a Helium Valve button positioned at 10 o’clock, this button is not working. The crown has a satin-finished face with a polished Ω logo. 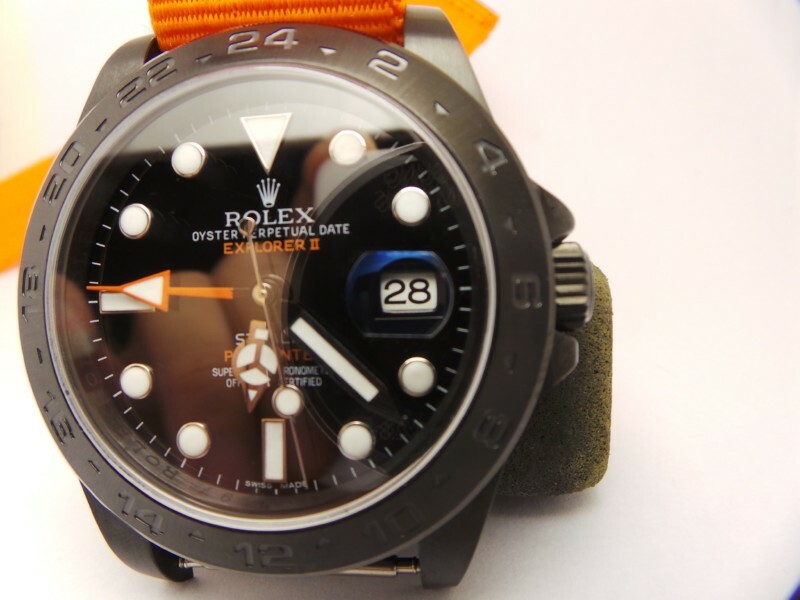 The bezel is made of black ceramic with silver markers, during 1 to 15 on the bezel, there is orange rubber. 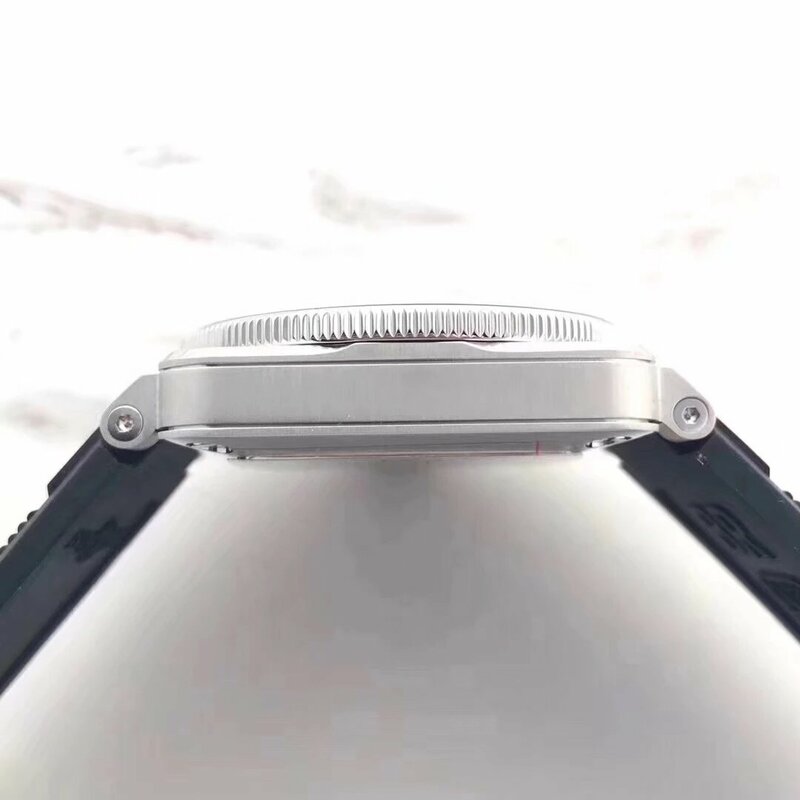 Case back is see-through crystal on the center, where you can appreciate the inner mechanism closely. 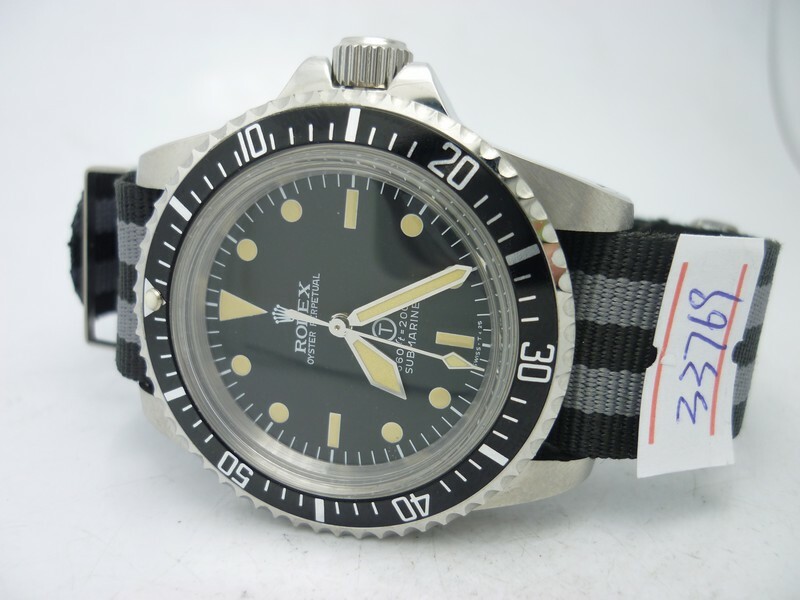 Like genuine watch, the replica features a black dial that is made of ZrO2. Orange Arabic numerals 6, 9 and 12 are very eye-catching, other silver hour markers are big and fully filled with luminescence in the center. The Ω logo under “12” and word “OMEGA” are in silver like other hour markers, they are three-dimensional. 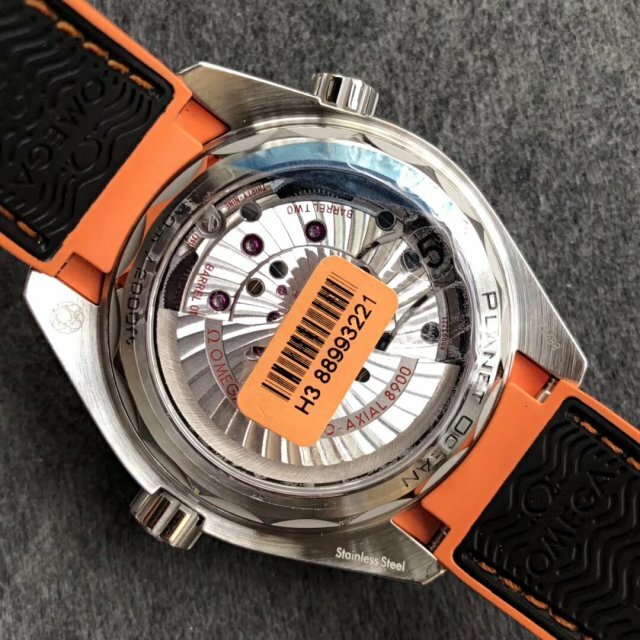 The central second hand has an orange tip, but it looks very close to red color, whatever, greatly different from the orange color on dial and bezel. 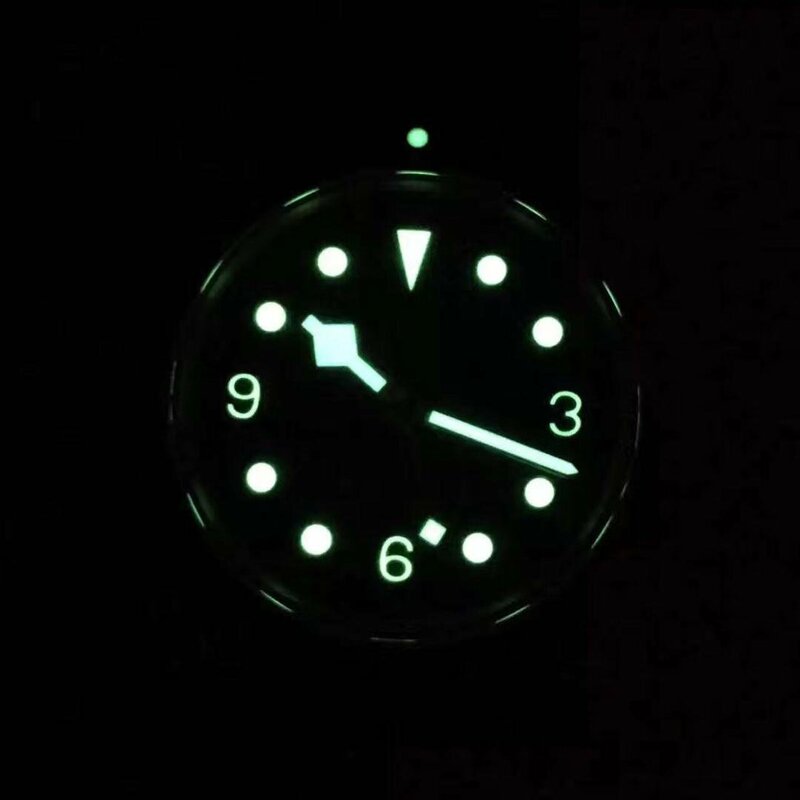 The dial can show two different lume light in the dark, you can see green and blue lume color at night. 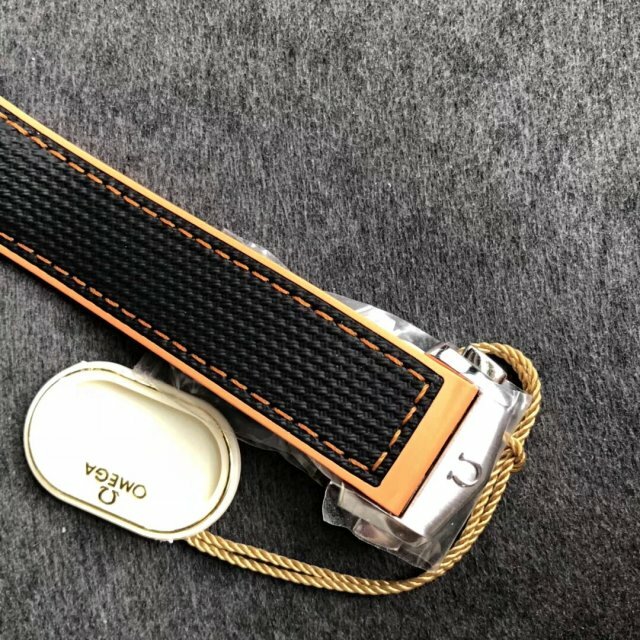 The replica has a very special band, it is made two different materials. 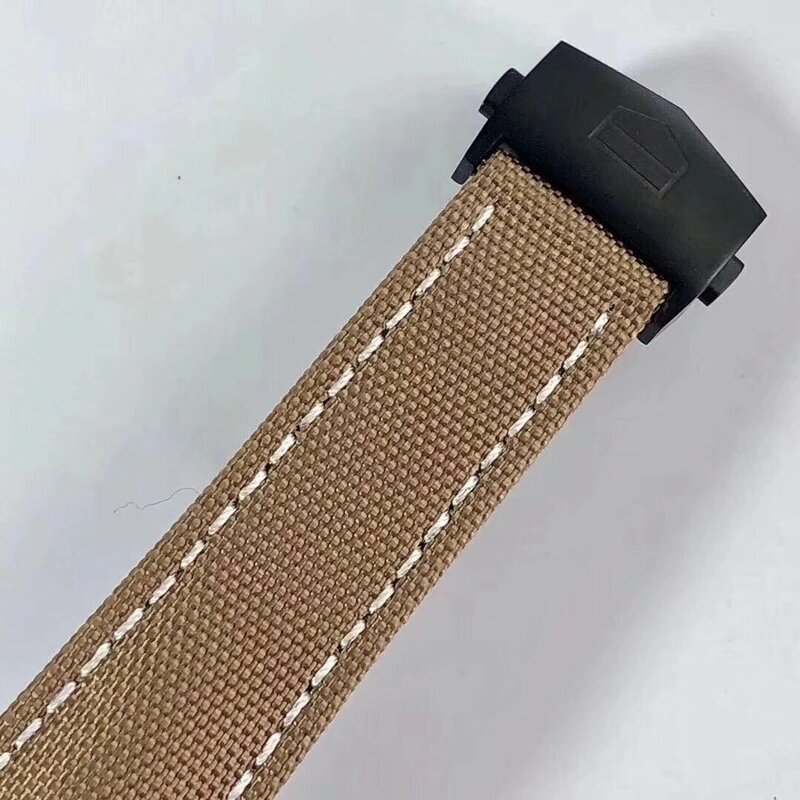 On the outside, you can see it is weave-style nylon material, which is in black, stitching on the band is in orange color, the edge of the band uses orange rubber. 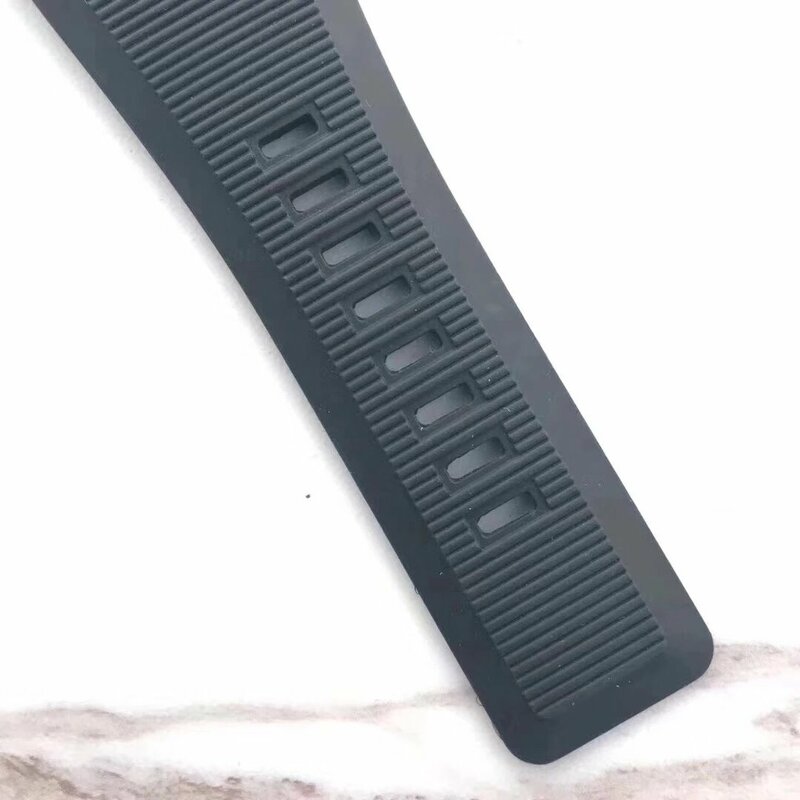 Check the back side of the band, it is black rubber. 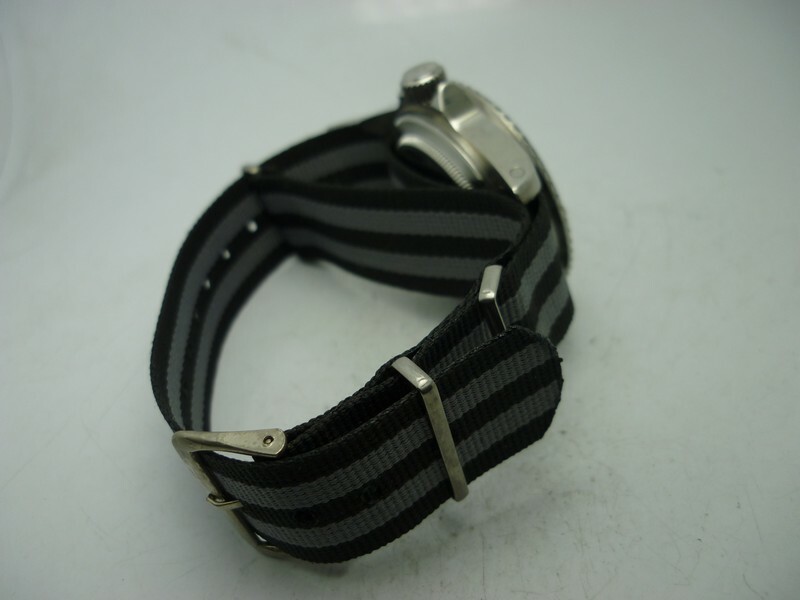 The two materials used on the straps greatly ensure the wearing comfort, but also maintain the cool look of the band. 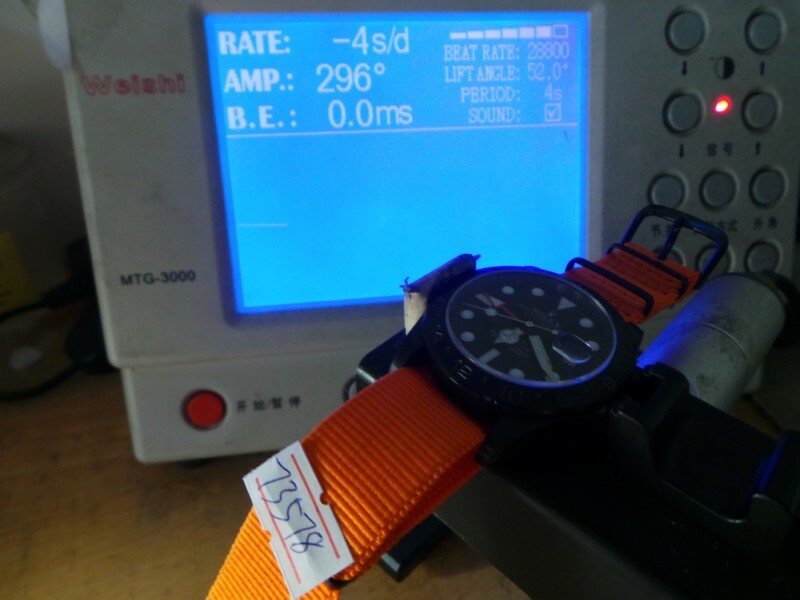 At last, please check the specification of the replica watch. 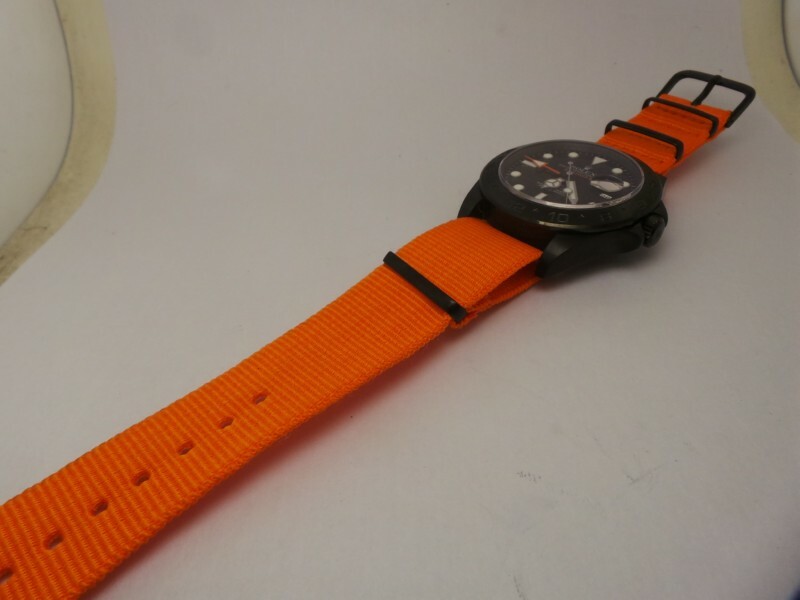 Bezel: Black Ceramic with Silver Markers, Orange Rubber Between 0 and 15. 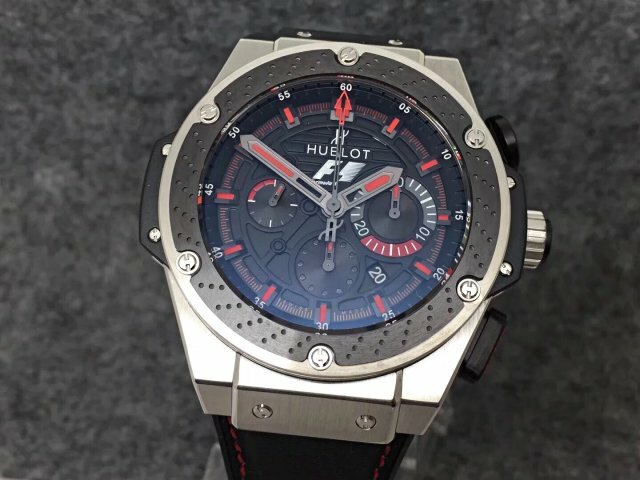 I do not know if Hublot still maintains a cooperation with Formula 1, but this Hublot King Power F1 replica watch is really amazing, it is the best I have ever seen. 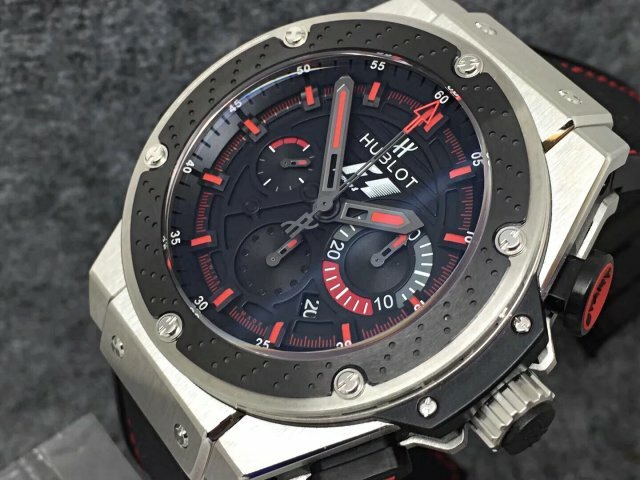 Too many Hublot watches I have seen in recent days, they all have similar color and dial layout, I have been tired, so I walked in the street to look something fresh, and this big guy attracted me. 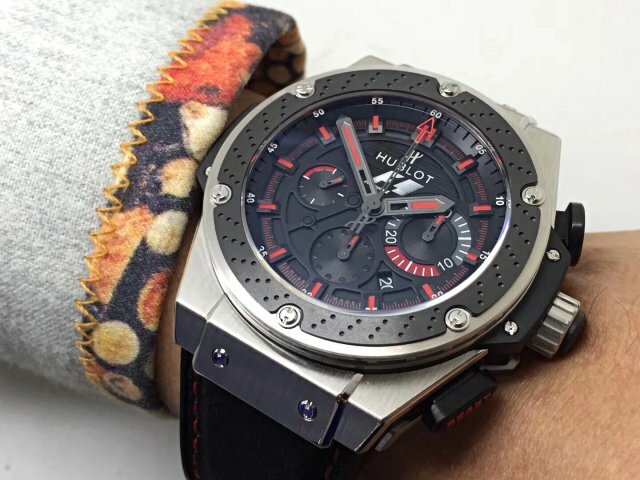 My watch supplier did not tell me this watch before, the store owner I met in this morning told me that V6 just published this replica Hublot watch, I was simply attracted by its eye-catching red color on the dial. 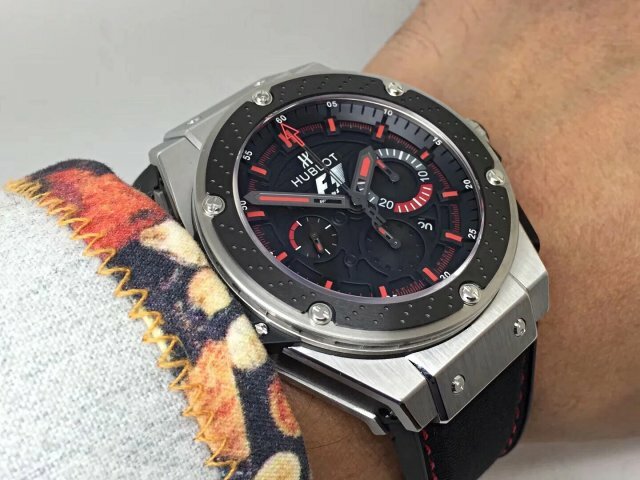 You know, V6 factory’s full name is HBB V6, at the beginning of its foundation, this factory is famous for making good quality replica Hublot Big Bang watches, this King Power F1 replica perfectly inherits the high quality features of HBB V6, which still makes the best Big Bang. 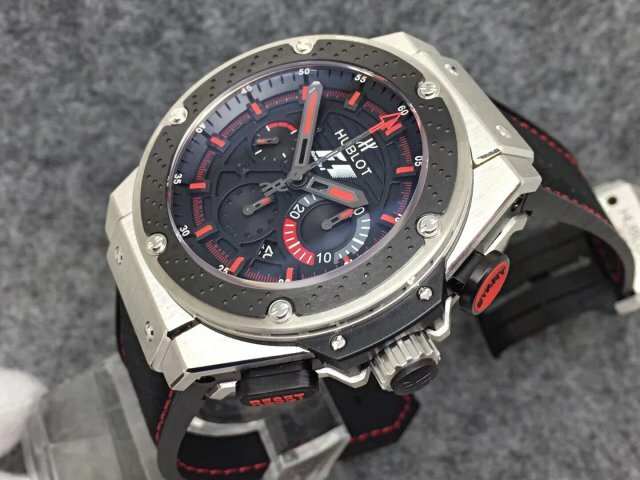 Actually Hublot is a popular sports Swiss watch brand that has a big amount of need all over the world, but among their Big Bang collection, I seldom saw the King Power F1 model, now the appearance of this F1 watch, I think a lot of racing lovers will buy this watch. 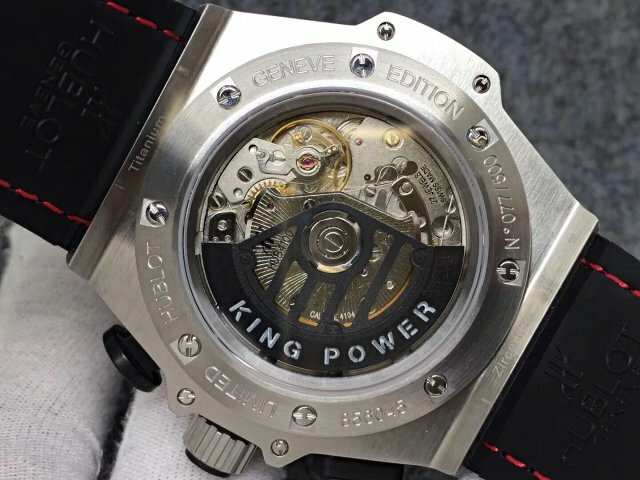 The case looks a little bigger than common 44mm Big Bang, this King Power F1 is 48mm in case diameter, it is also very thick, which has been up to 17.5mm. 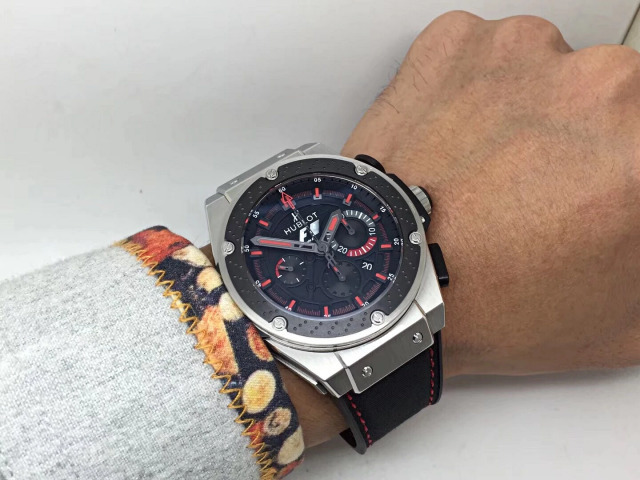 So, you will feel heavy when wearing the watch on wrist. 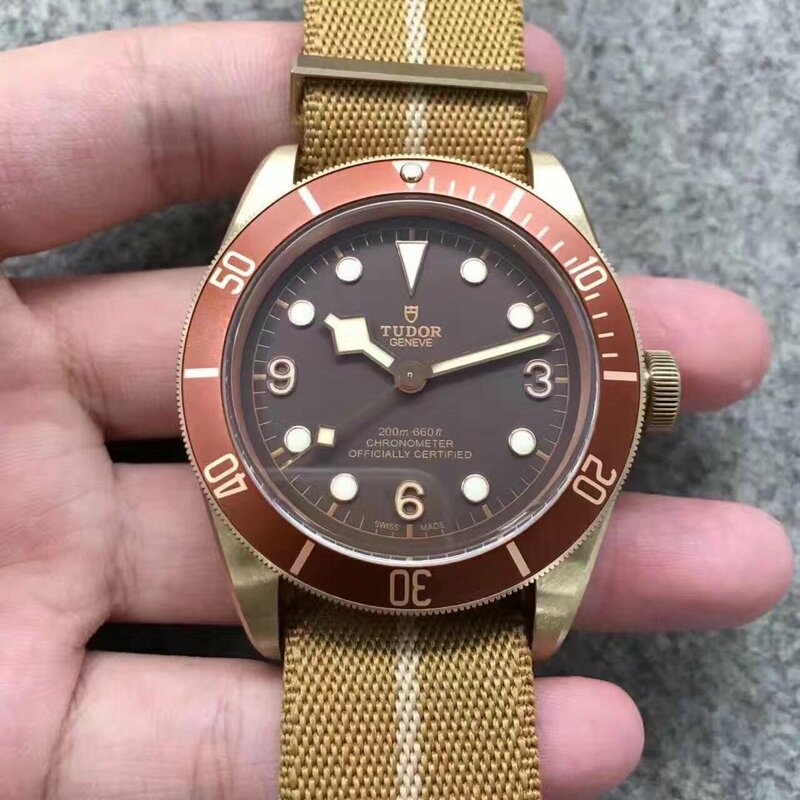 However, it is the right watch for some tough guys who love large-size watches, for example, Sylvester Stallone loves Panerai. 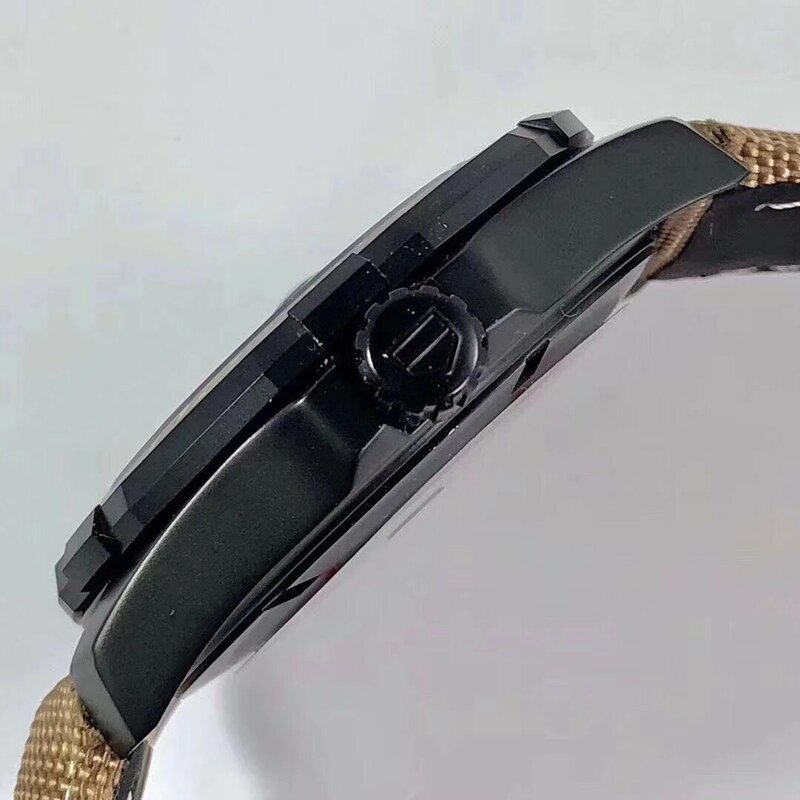 Now we back to this King Power F1, its case is fully made of solid 316L stainless steel, which is brushed, both case and bezel have screws to fix. 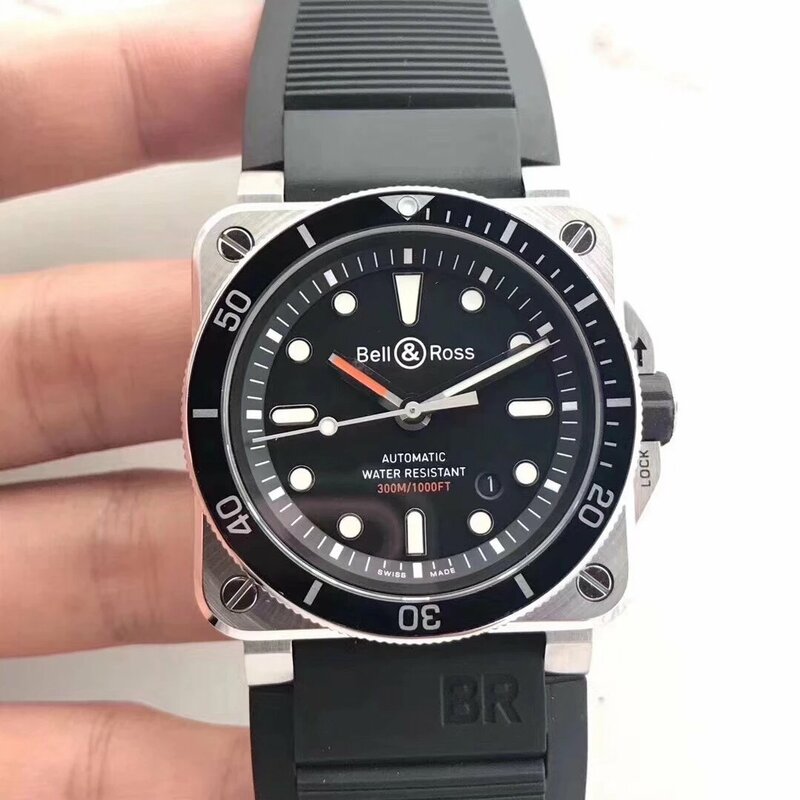 The bezel is made of black ceramic and has six silver screws. 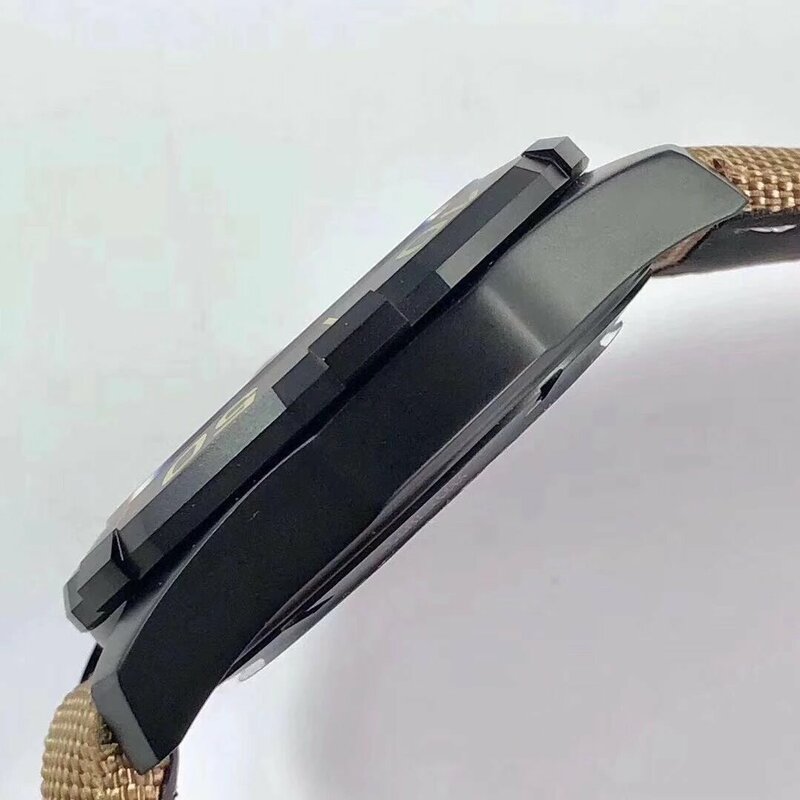 Black ceramic bezel also has a lot of holes, I know it imitates the part design on F1 racing car. 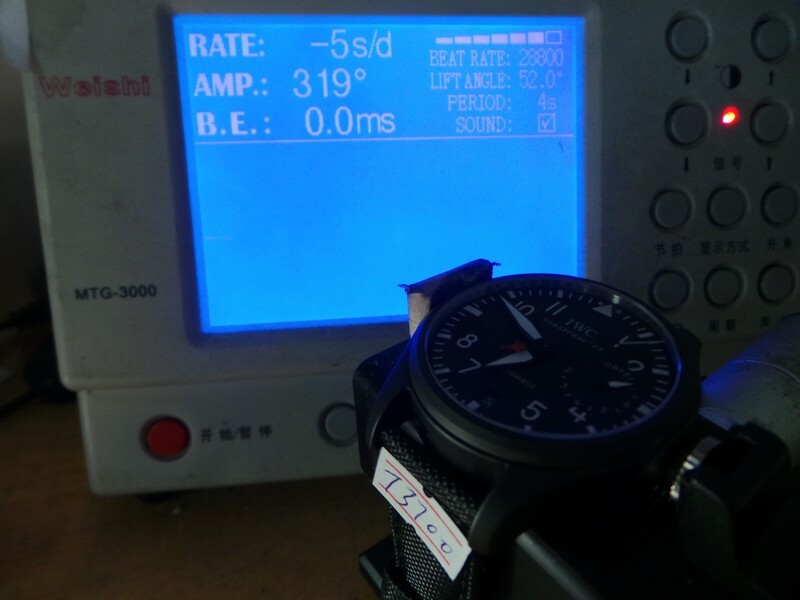 On the right side of the case, there are two buttons for you to operate chronograph function. 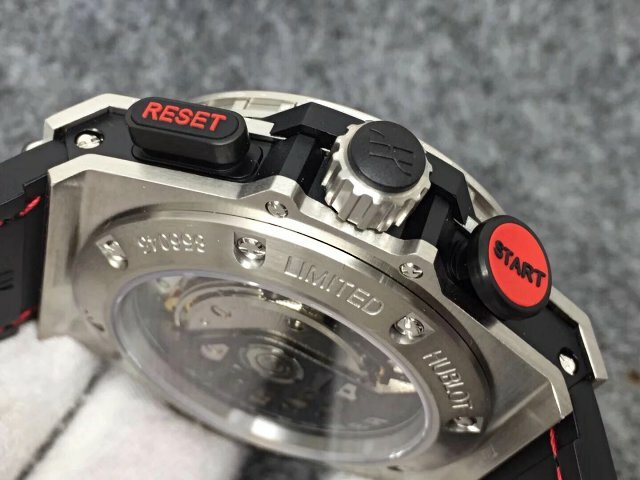 The round button at 2:00 has a black “START” word in red background, while the RESET button has red word in black background. 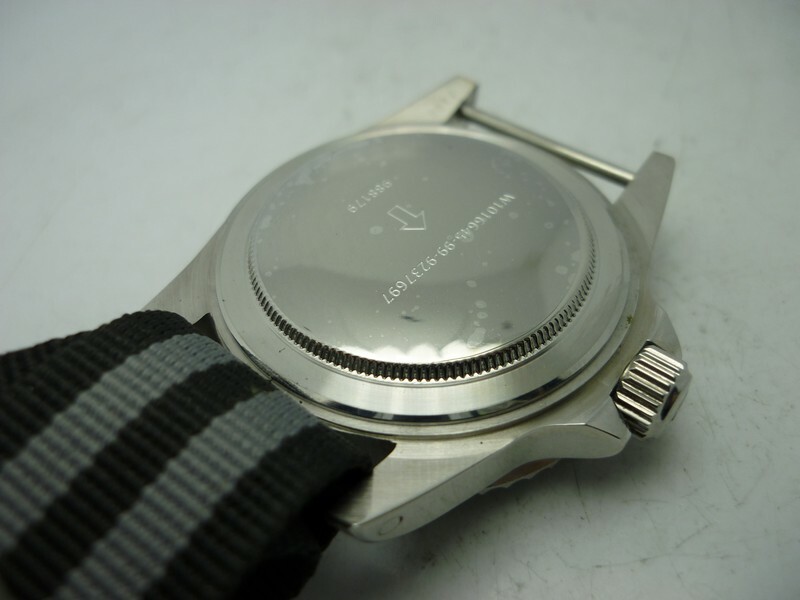 Like you see, the case has used three different materials at least, they are stainless steel, ceramic and rubber. The dial is very classic. 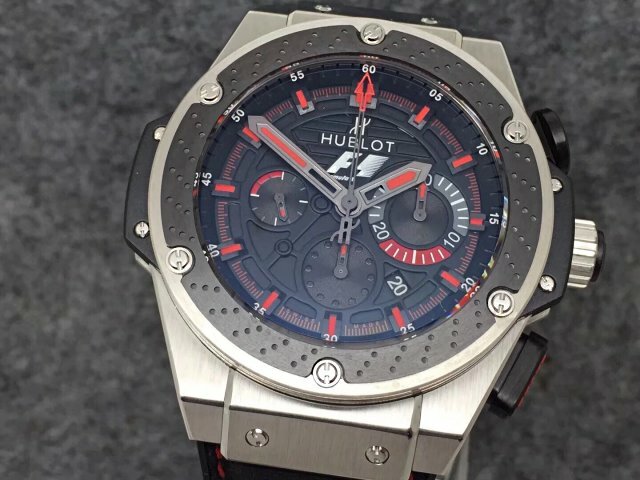 Like genuine watch, the replica has a black dial but uses F1’s iconice red color on the dial. Black perfectly matches red, it is one classic group of colors. 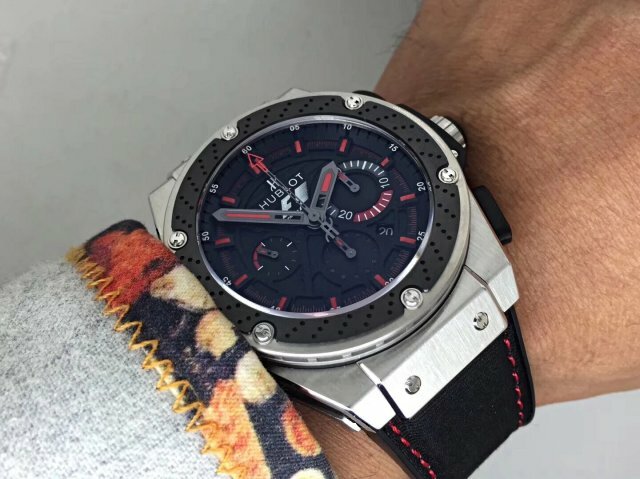 Not only in layered, the usage of red color is the biggest highlight of the whole dial. I know the dial gets its design inspiration from the dashboard of F1 car. Three subdials work the same way as genuine. Small seconds hand runs on subdial at 9 o’clock, the bigger subdial at 3 o’clock is 30-minute chronograph counter, while the all-black small dial at 6 o’clock is displaying 12-hour chronograph. All hands are not in white stainless steel, but in Tungsten steel color. 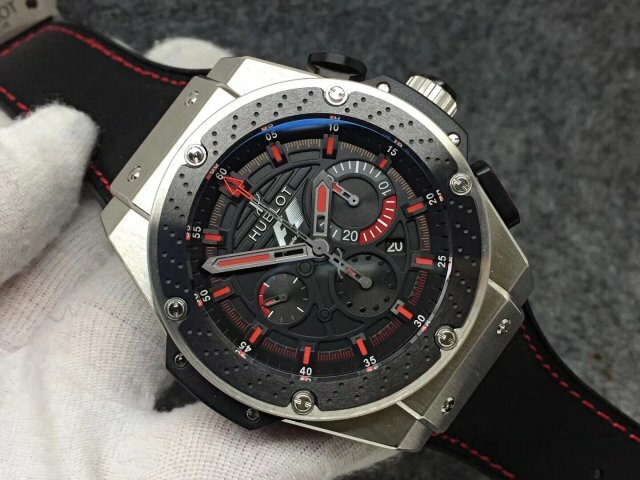 The long second-chronograph hand in the center has a striking red tip, I like the dial design, maybe this will become my most favorite sports watch, I have gotten one from V6. 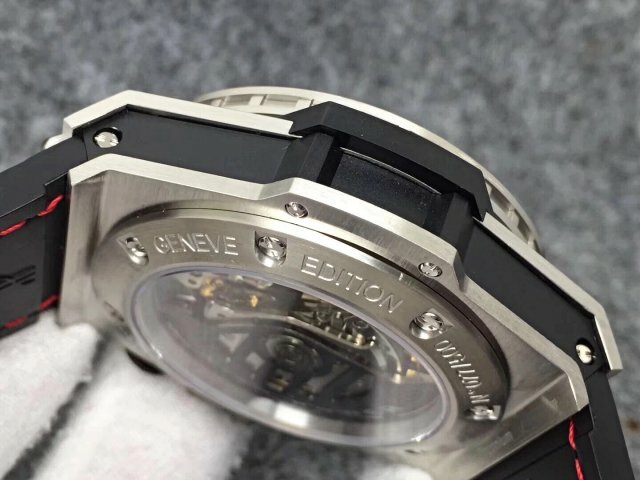 The movement is an Asia clone HUB4100, which is modified on basis of Shanghai Chronograph movement. 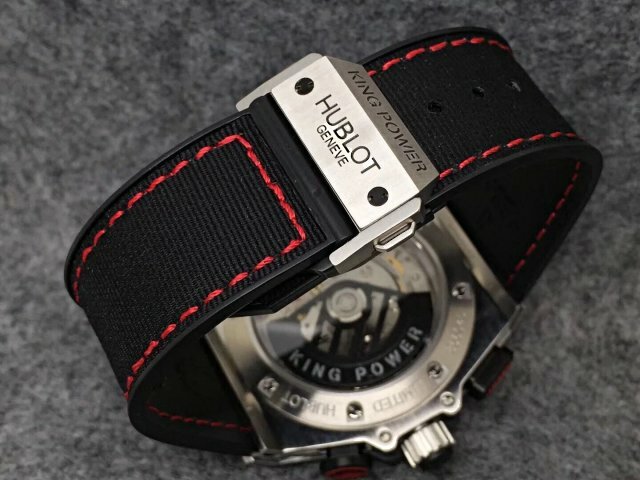 The black skeletonized auto rotor has white words “KING POWER” being engraved, the top movement plate is engraved with Hublot logo and “HUB4100”. 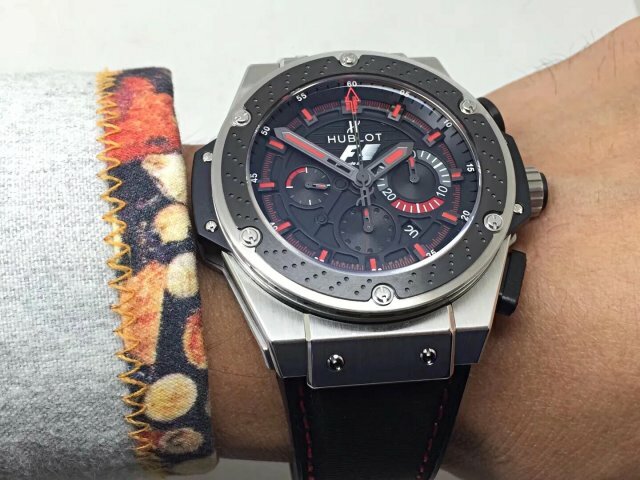 Whatever, the movement has a very close look to genuine Hublot HUB4100, its stability is also very high. 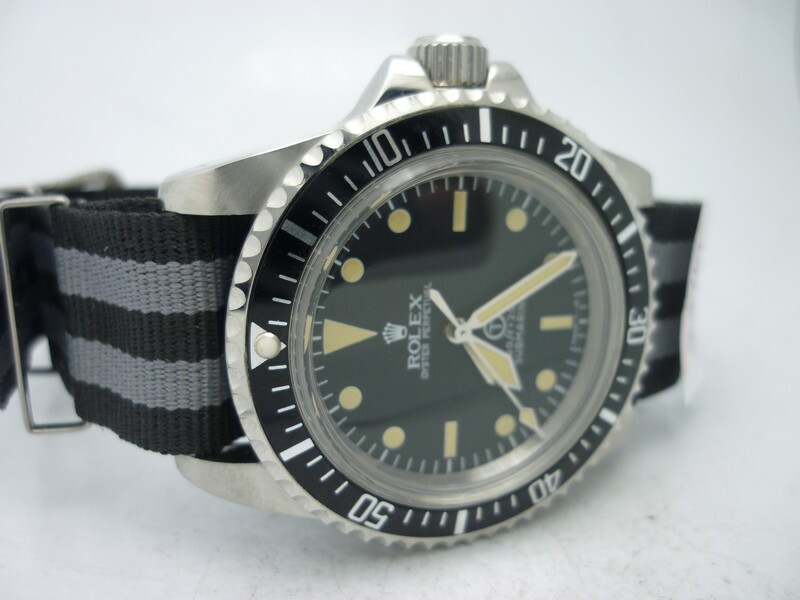 Like the dial, the band of the replica watch is also a big highlight. It uses black nylon material on outside, while the back side that will touch your skin is black rubber, which feels very soft. 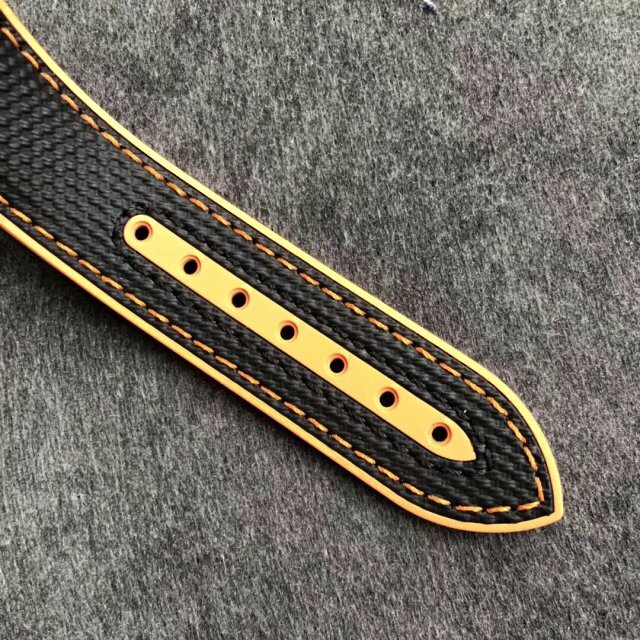 The outside nylon is in black with red hand stitching, it looks very cool. 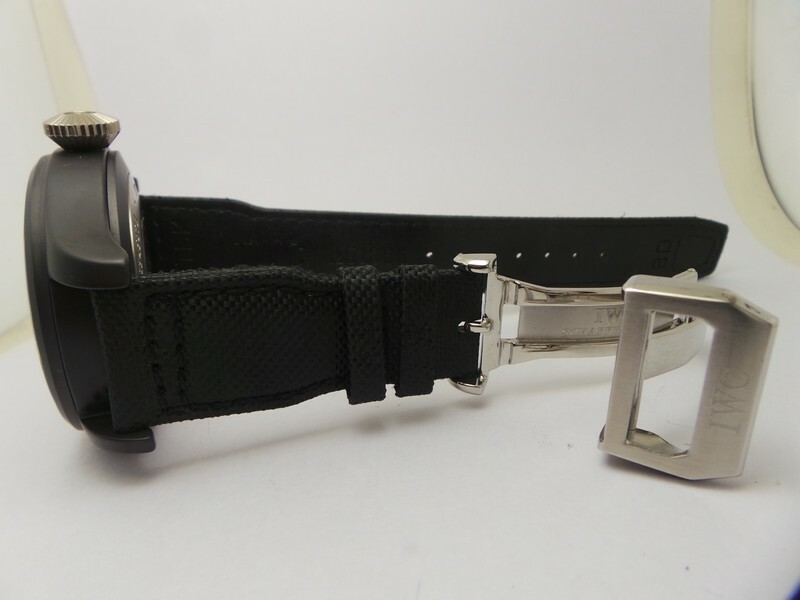 The buckle has correct engravings that are filled with black. 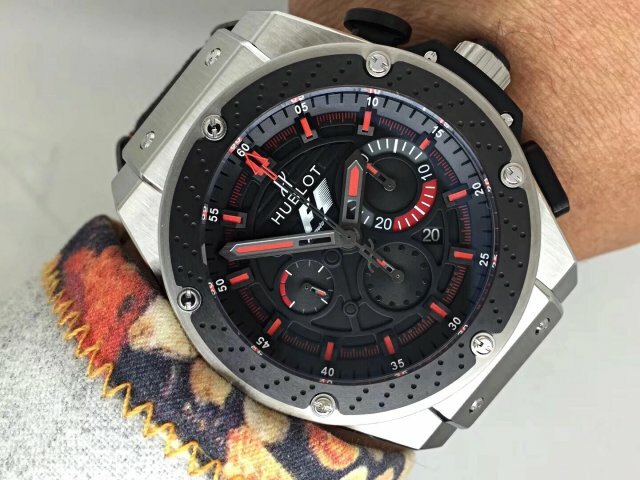 The watch is the best Hublot F1 replica that has been published in recent years, you will need such a cool watch when driving a sports car with your friends, are you going to be a fan of F1 now? 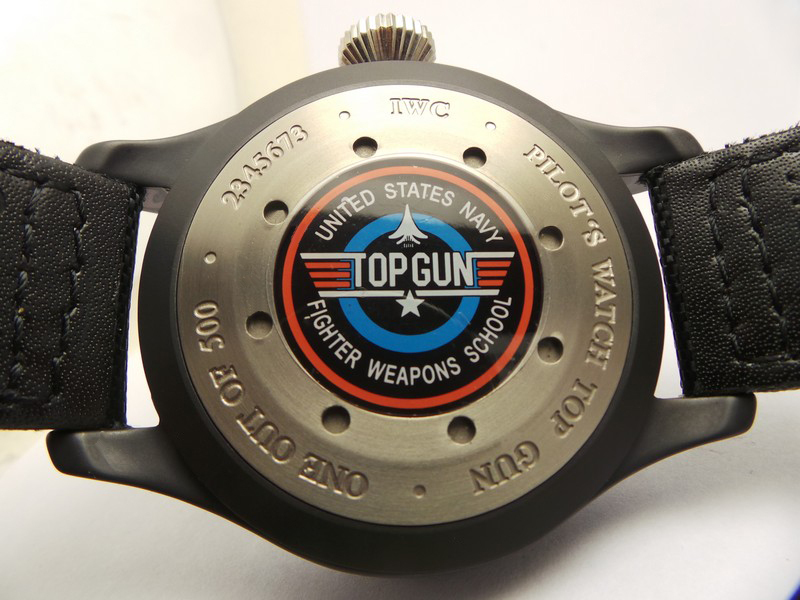 Actually I have introduced two Top Gun replica watches on my blog, they are IW388002 and Top Gun 5019, each of them is made by a big famous factory and has a great quality. 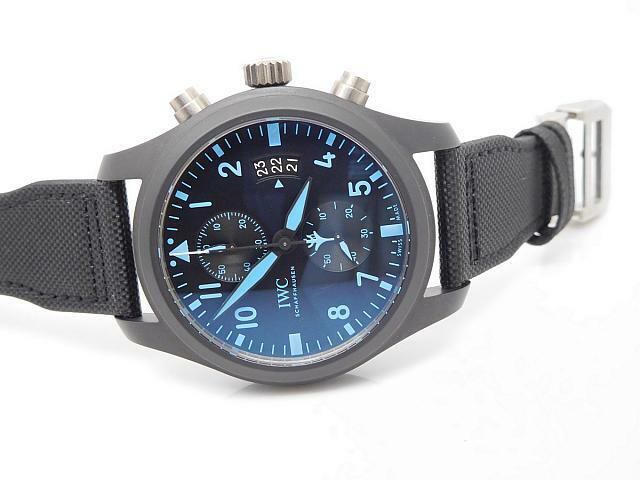 Here I am going to bring another Top Gun watch, it is the replica of latest IWC model published in 2016 SIHH. 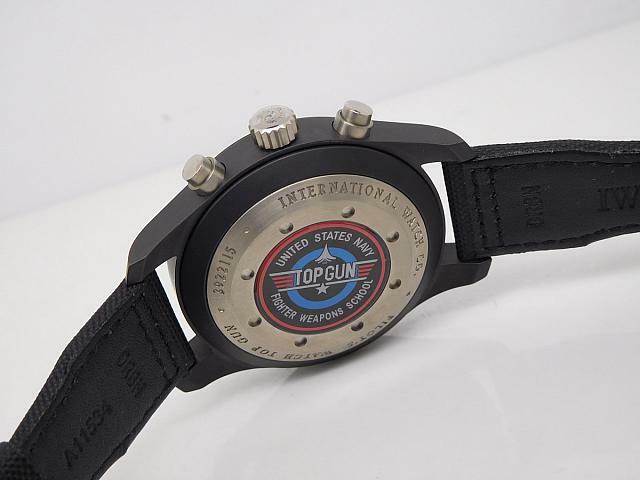 Compared with the two Top Gun replicas I posted before, this one was added Chronograph function, under the military appearance, the watch becomes more practical. 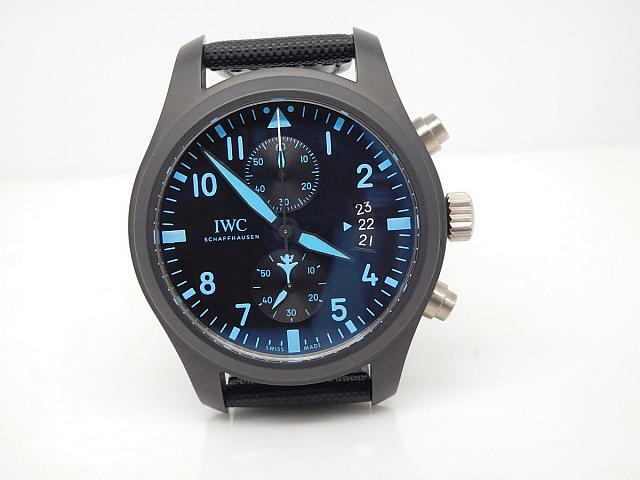 The biggest advantage is it uses a bold and striking blue color on the dial. About this model, the factory made two versions, blue and green, please see the photos above. 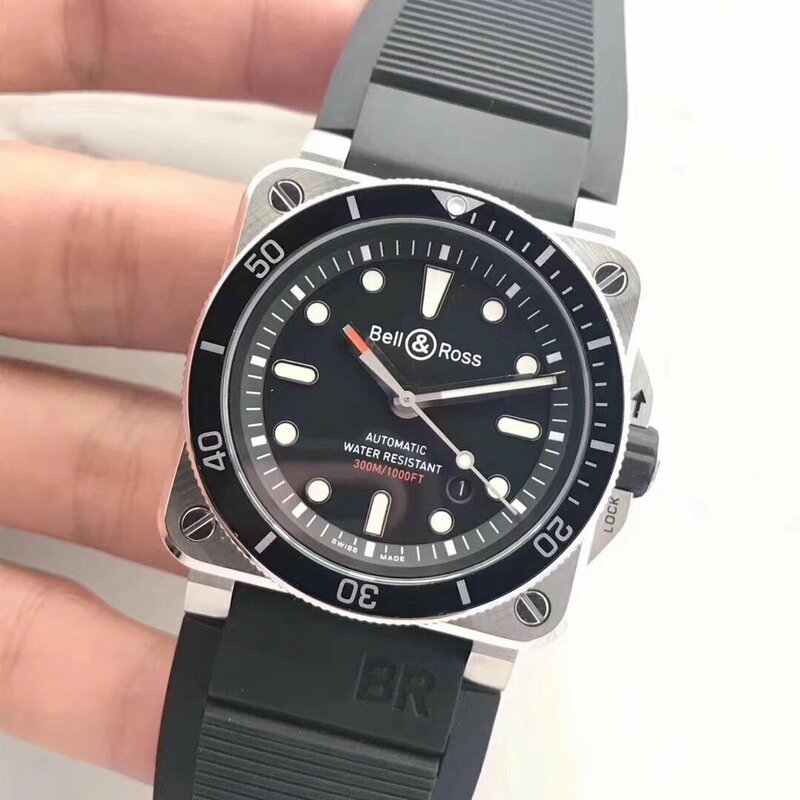 Fully made of black ceramic, the case is brushed, it is a big watch, bigger than Submariner because the case diameter is 46mm. 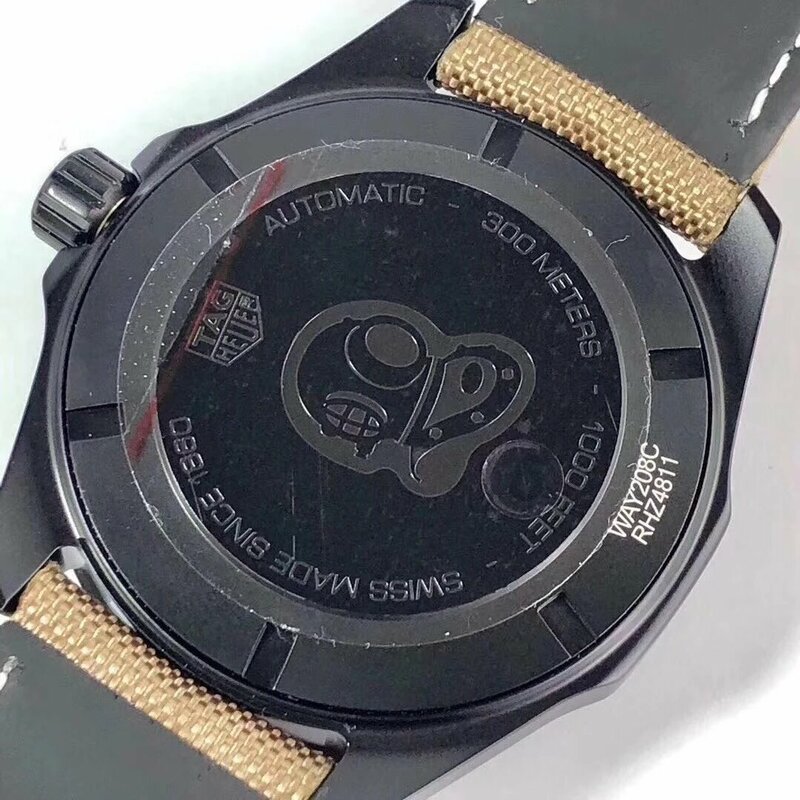 The crown and chrono pushers are Titanium made, so is the solid case back, which has a classic TOP GUN logo. 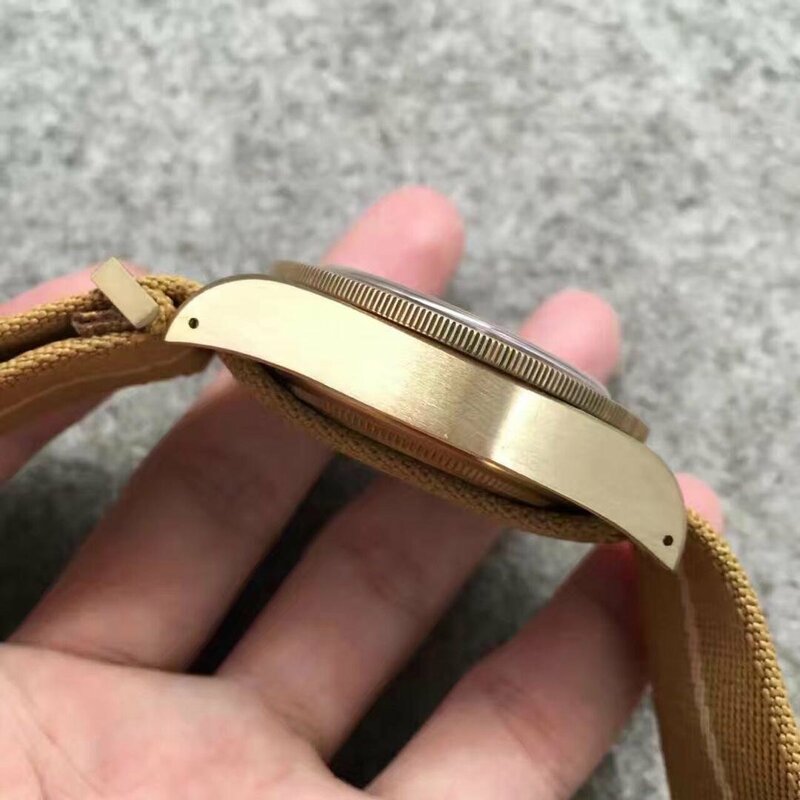 Seeing from the side, the case has an obvious arc, especially the lugs, so it could fit your hand well when contacting with your wrist. The engraving details on crown are delicate, you can see every letter on it clearly. 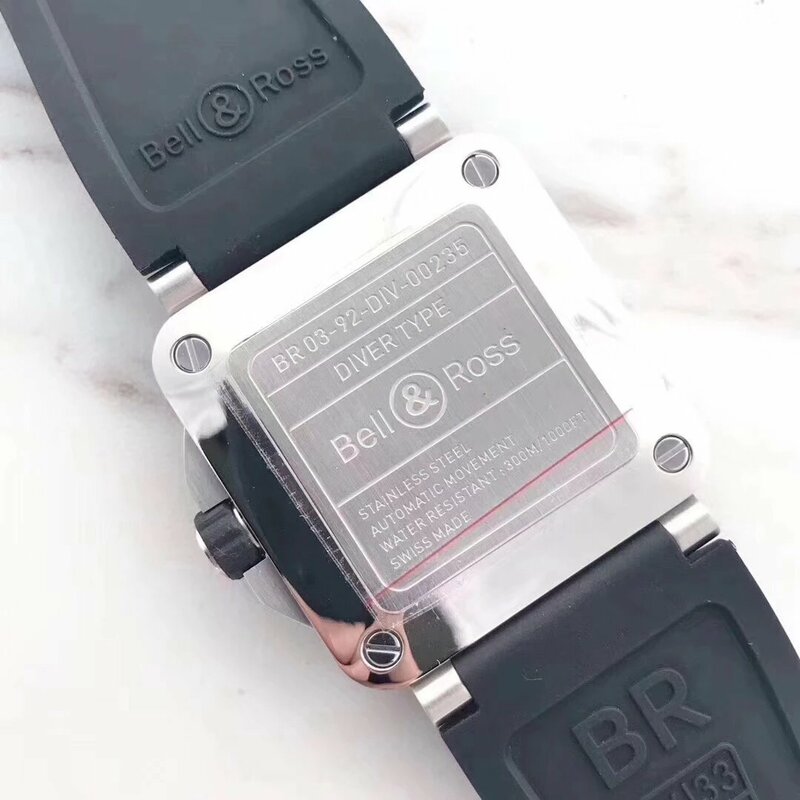 Real ceramic makes the replica watch feel a little heavy, and the brushed finish will let you feel its high quality texture more well. 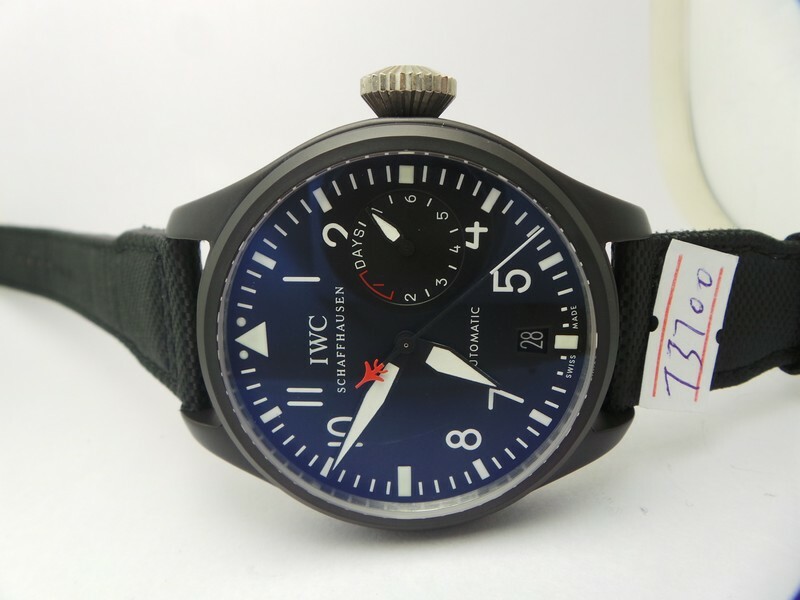 Blue markers and hands form a sharp contrast to black dial color. 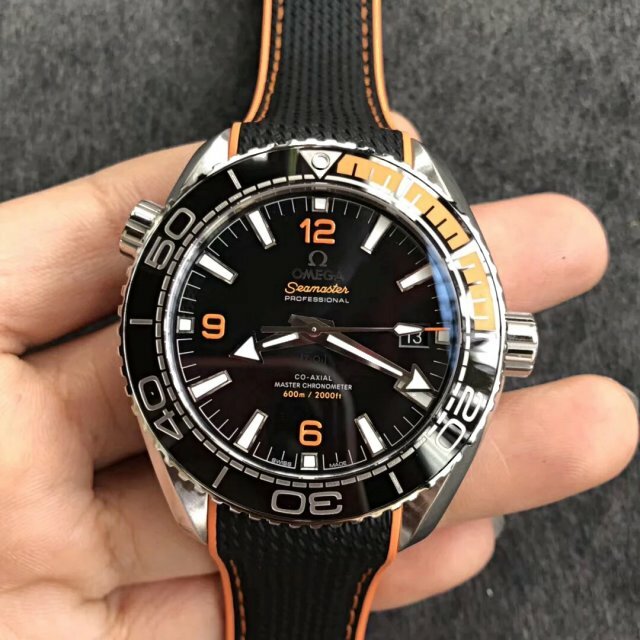 Please notice that not all hour markers are luminous, only the markers at 3, 6, 9 and 12 are applied SuperLume C1 luminescence, so are hour and minte hands. There are two small dials, the one at 6 o’clock is for small seconds display, while the top one at 12 is for 60-minute chronograph. 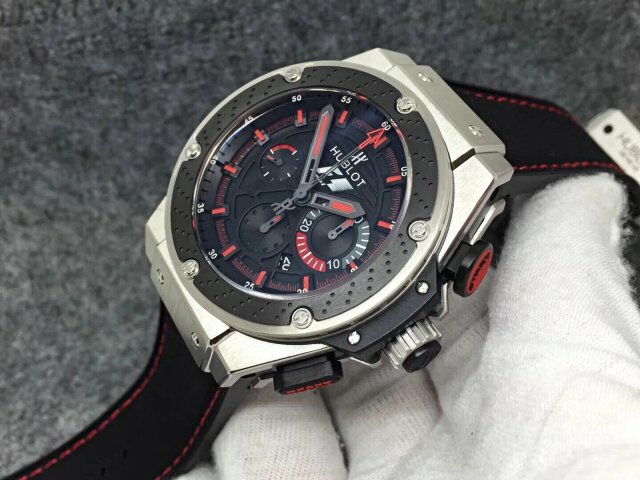 Central second-chronograph hand is striking, it is black but has a white tip and flight end. The date wheel in fan-shaped displayed at 3 has white font in black background, this also increases its readability. 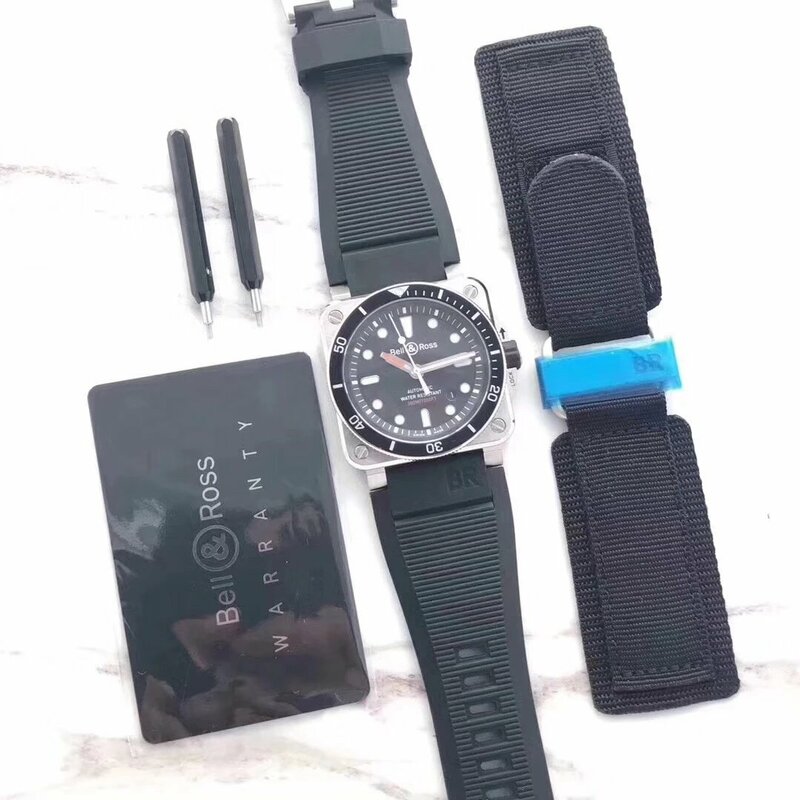 Finally it comes to the band I favor most, the band is made of nylon on outside, while the inner side is made of genuine black leather and has IWC logo. The keepers on the band are all fabric. 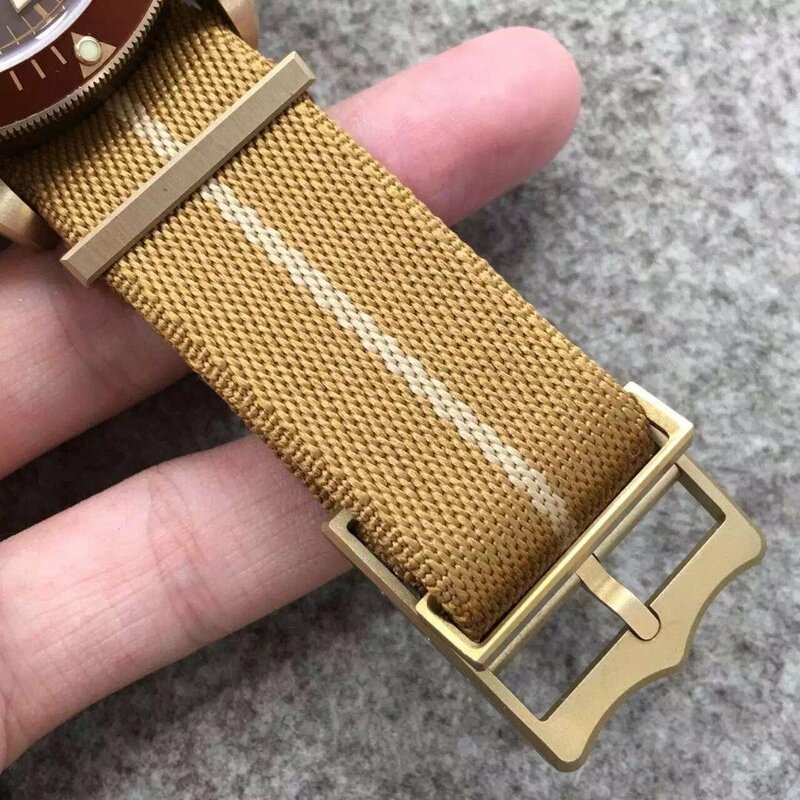 The band design guarantees a good wearing comfort on the side contacting with your skin, while its nylon outlook also adds points to military feeling to the whole watch. Ok, here is the lastest news coming from the market, two top grade Pilots replicas, on Sunday, I will bring you guys another great review. 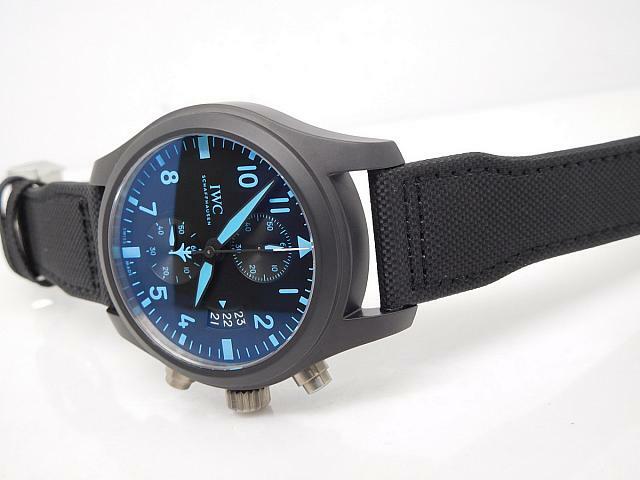 Today, I will introduce another black guy that is full of military style, here I have given reviews on several replica military models such as Zenith Pilot, Omega 007 and Submariner 5517, this time, the IWC replica watch I am going to review is an authentic military pilot watch, its full black appearance just exactly proves this point. 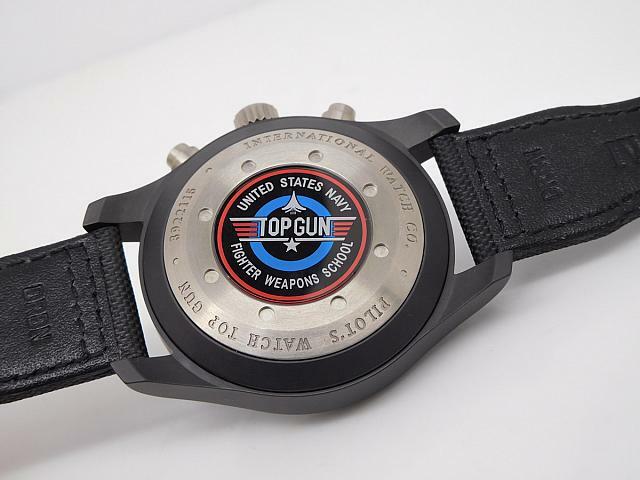 The watch is a high end clone of Top Gun 5019, the most unique place on this replica is that it features real ceramic case, wearing such a timepiece will make you look more tough. 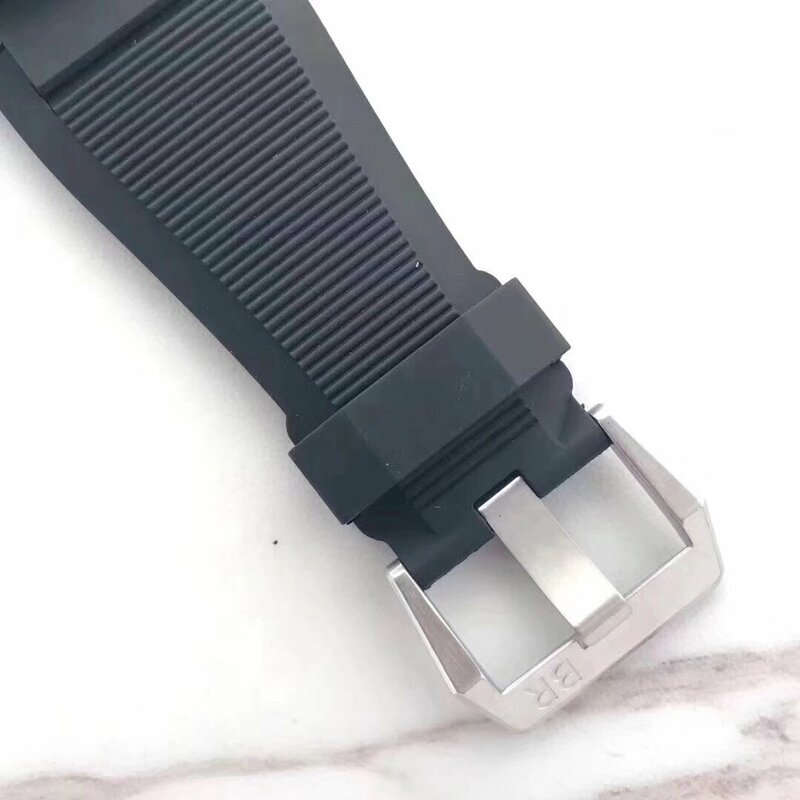 First, the full ceramic case is moulded from one piece, this process needs higher watch-making technology and skilled watch masters to complete. 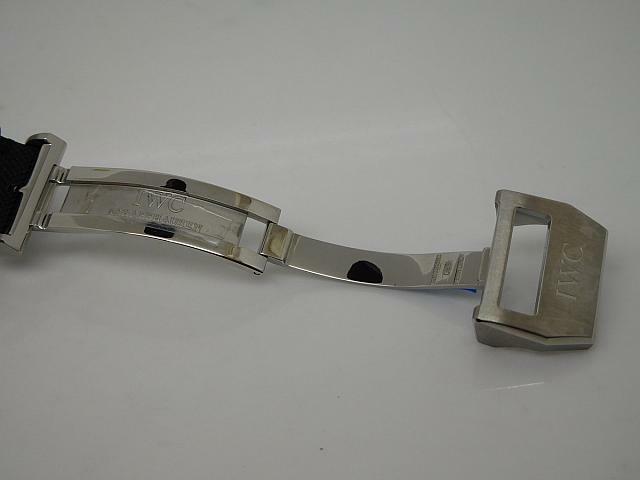 Whether the size, lugs width or engravings, they are 1:1 replicated according to genuine. The black ceramic case has top-level brushing process, touch the case by hands, it gives you a genuine feeling. 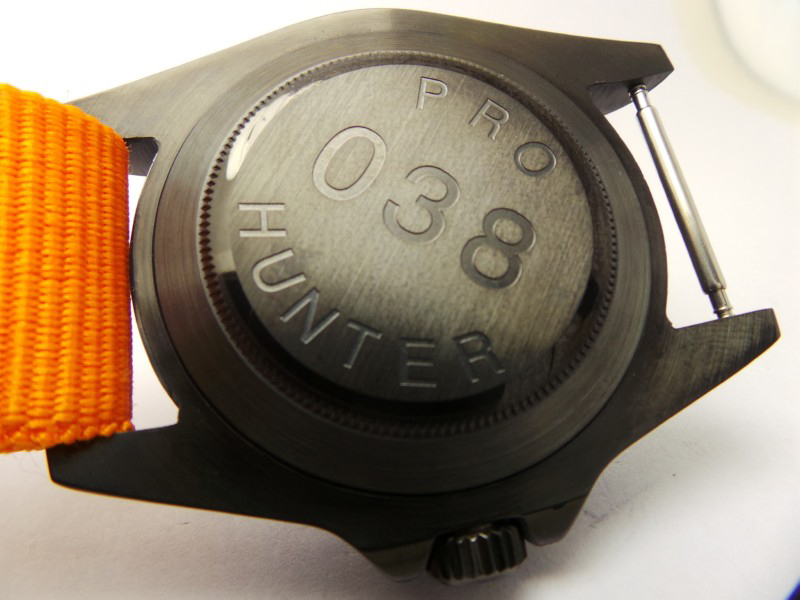 The black dial extremely simple, with white hour markers and printing, the dial gives a high readability. 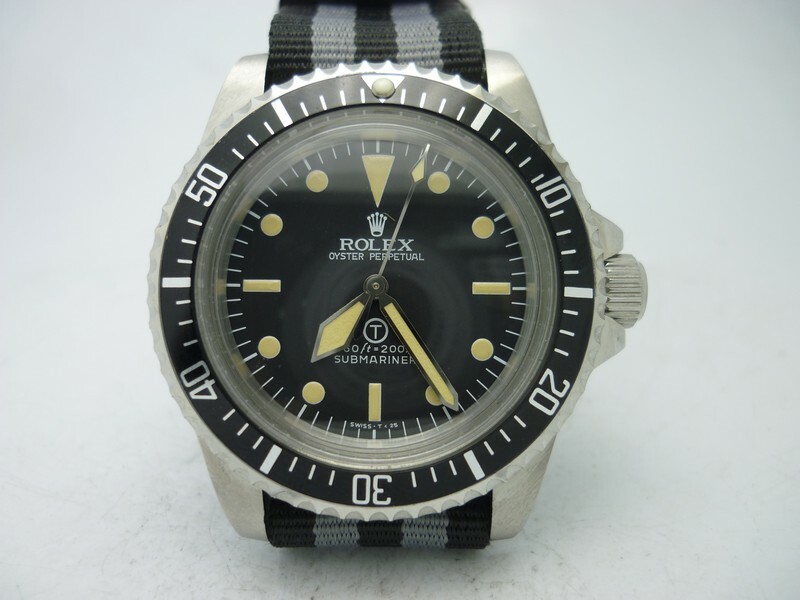 There is a small subdial at 3 o’clock indicating 7 days power reserve, however, this function is faux on this replica, the small hand is fixed permanently. The central second hand has an unqie tip in white color, its another end is iconic Top Gun airplane logo in red. A small square date window is placed at 6. 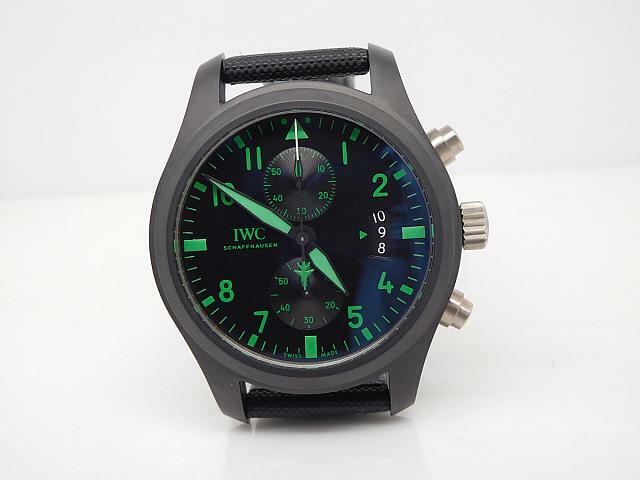 The replicas features a superlumed dial, which will gives you strong green light at night. 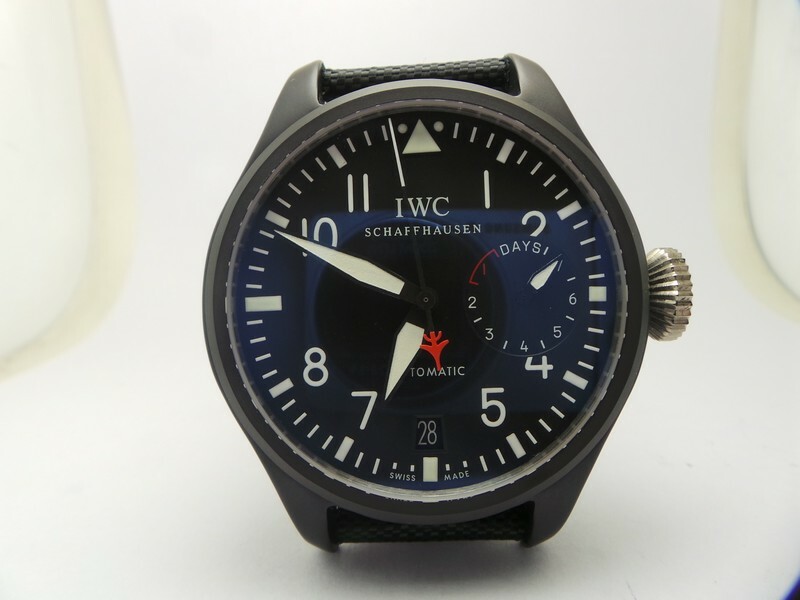 The last two things that make me love this replica IWC deeply are its special caseback engravings and nylon strap in black. 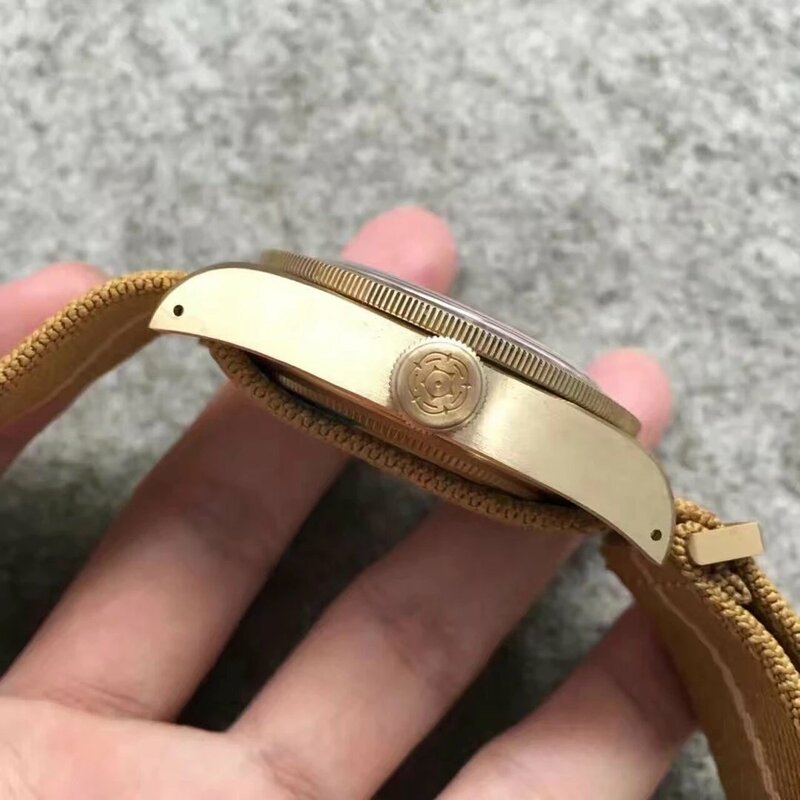 All high end replica watches have good engravings on caseback and clasp, so is this one, you can check its “IWC” engraving on the clasp, it is deeply curved. 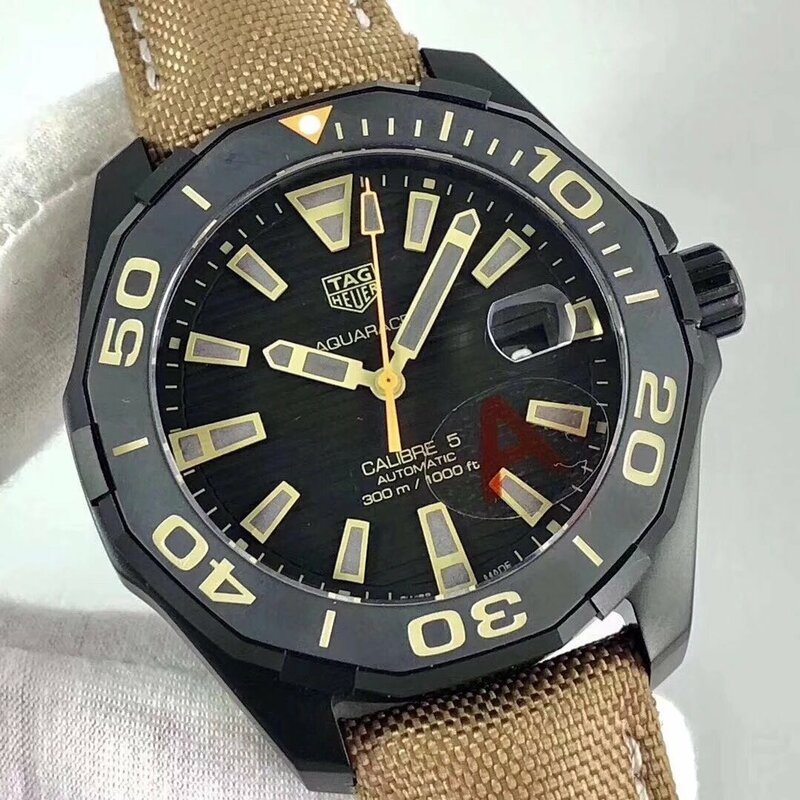 The black nylon straps add more military favor to this replica, which makes it full of tough charm but absolutely a low-key timepiece active on your wrist. 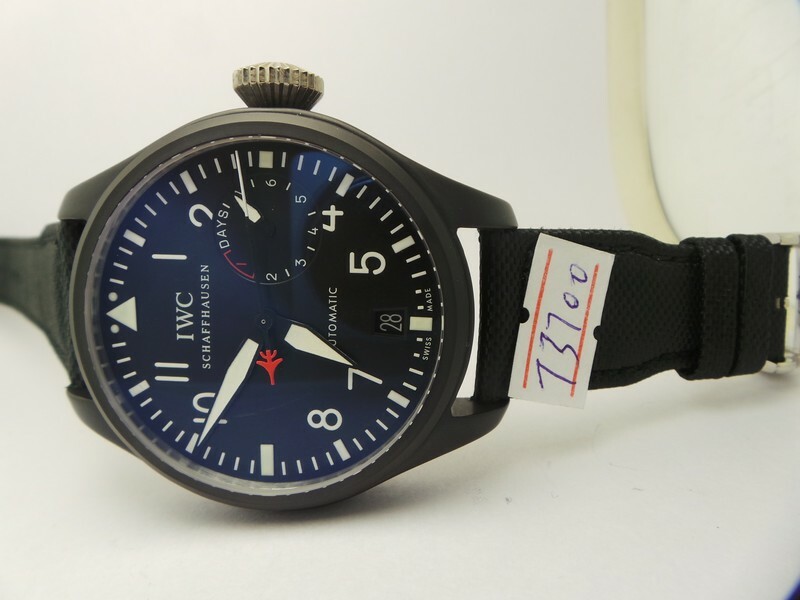 The following is the specifications of this IWC Top Gun replica. 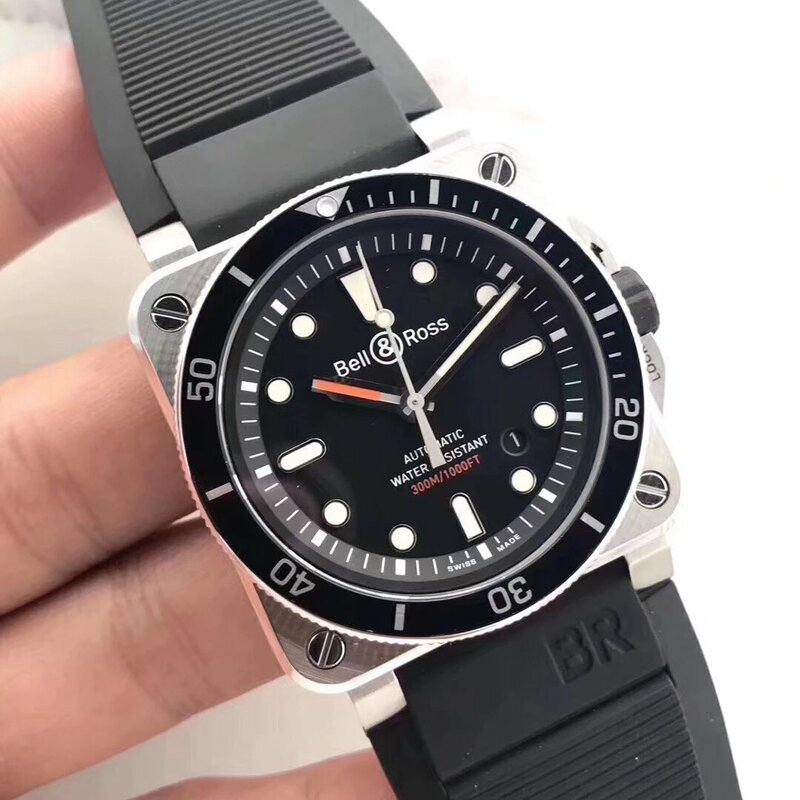 The case is made of hard stainless steel and features thick PVD black coating on surface, the dial is black and has details in black, white and orange colors. 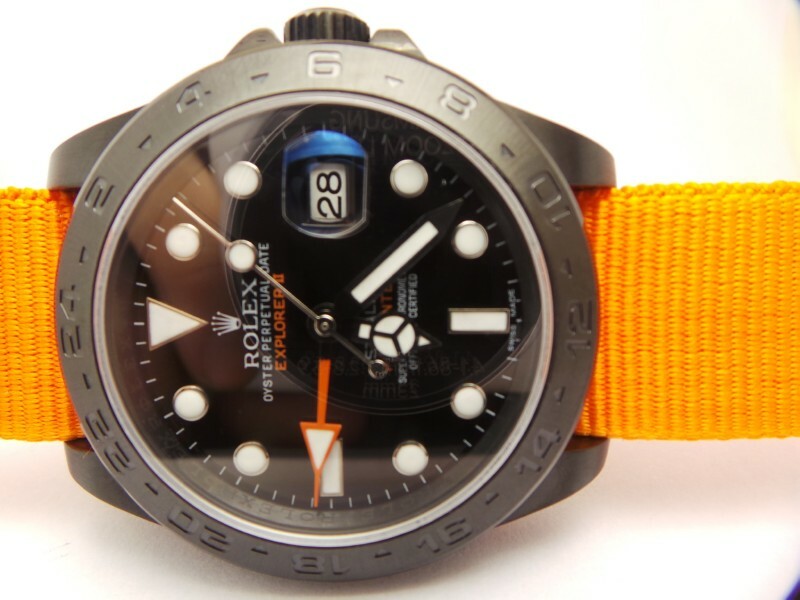 It gives a high readability when these white lume coated hour markers lying on the black dial, the central orange hand is pointing to the 24-hour markers on the bezel. The most important thing is that the date window has the correct cyslops, which features AR coating as per genuine. 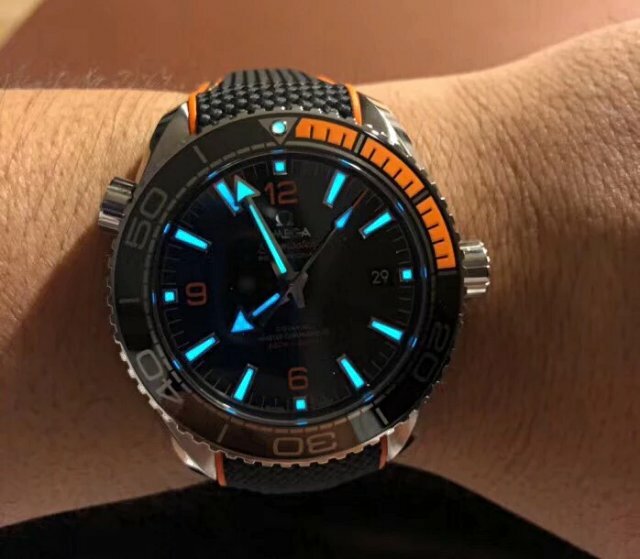 By the way, due to the best lume materials used on hour markers and hands, the replica watch can emit strong blue light in the dark.